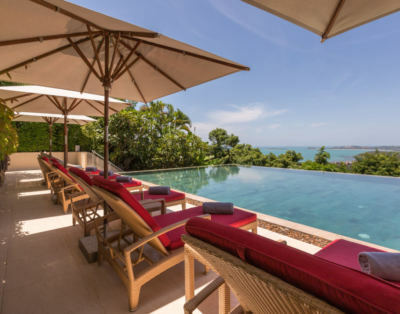 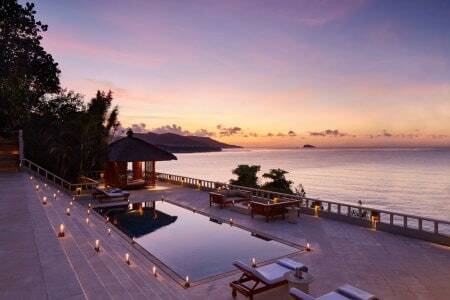 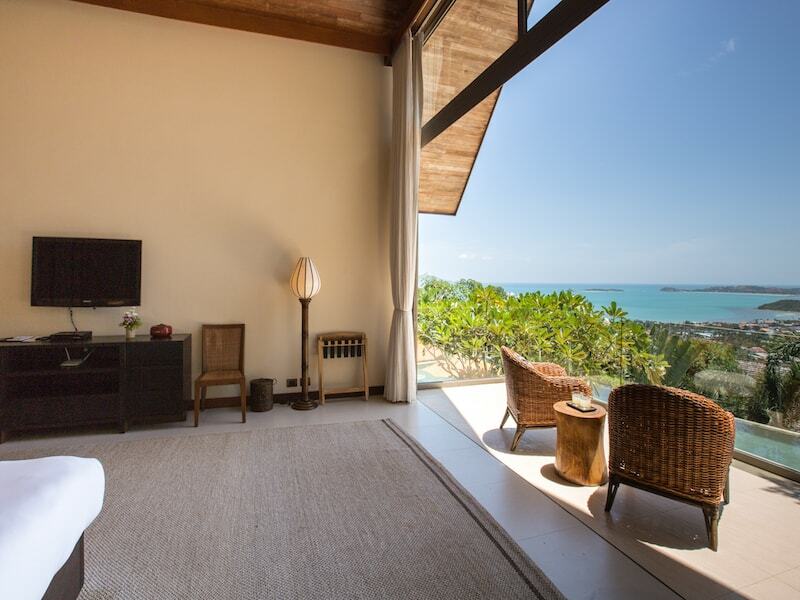 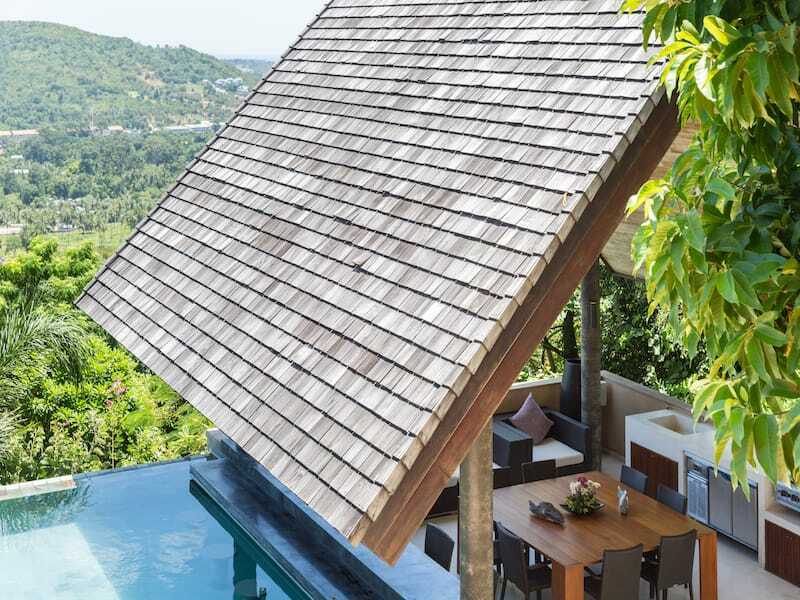 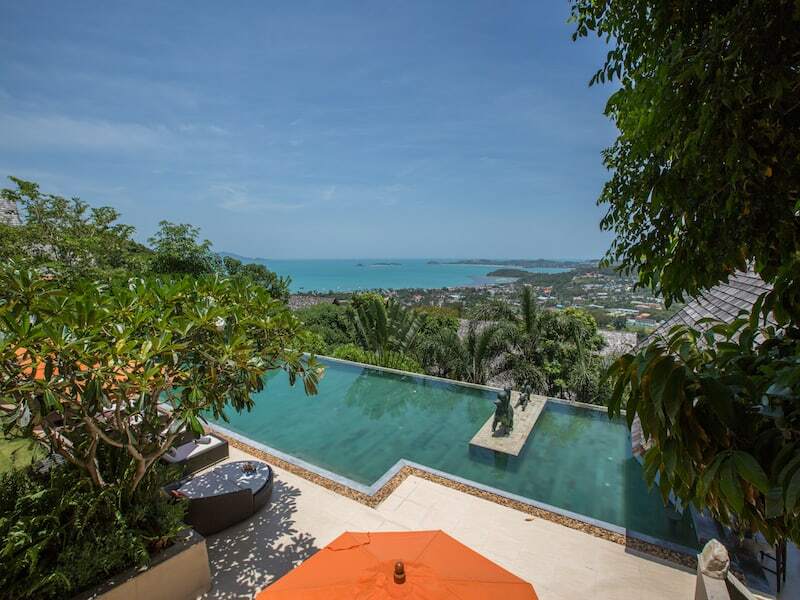 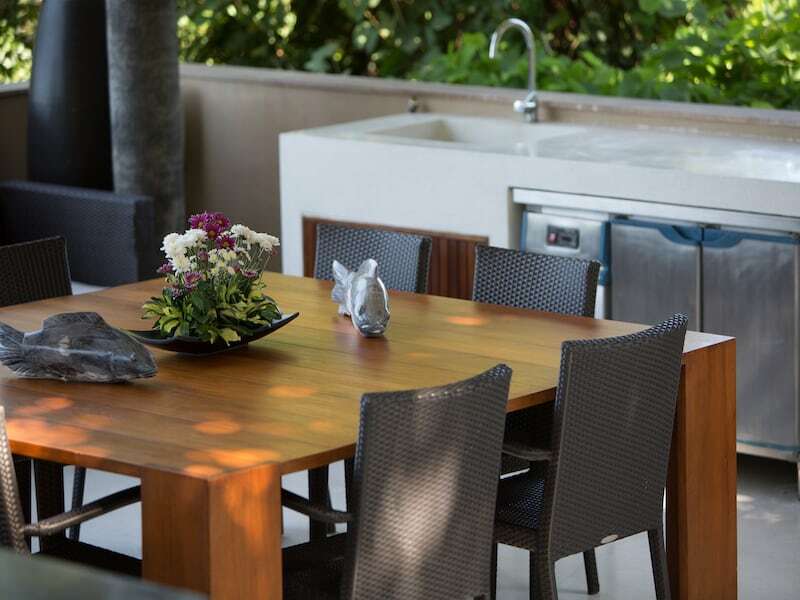 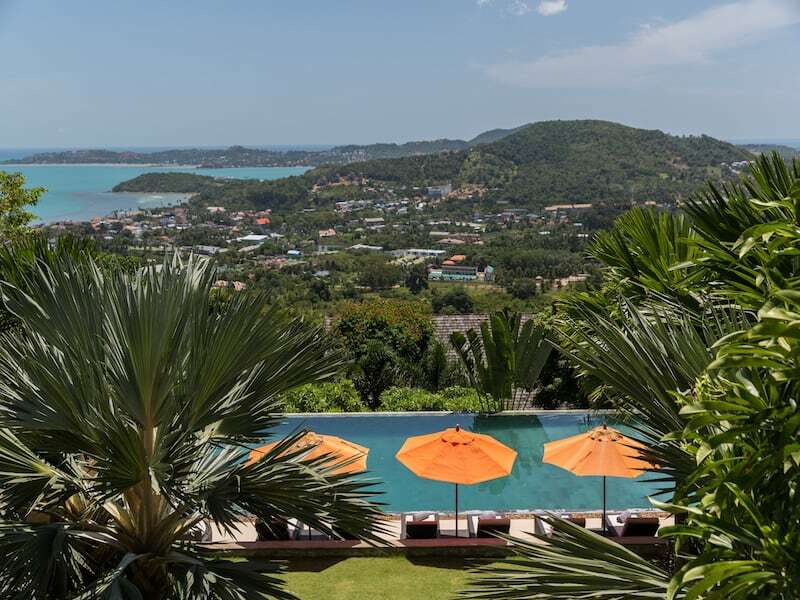 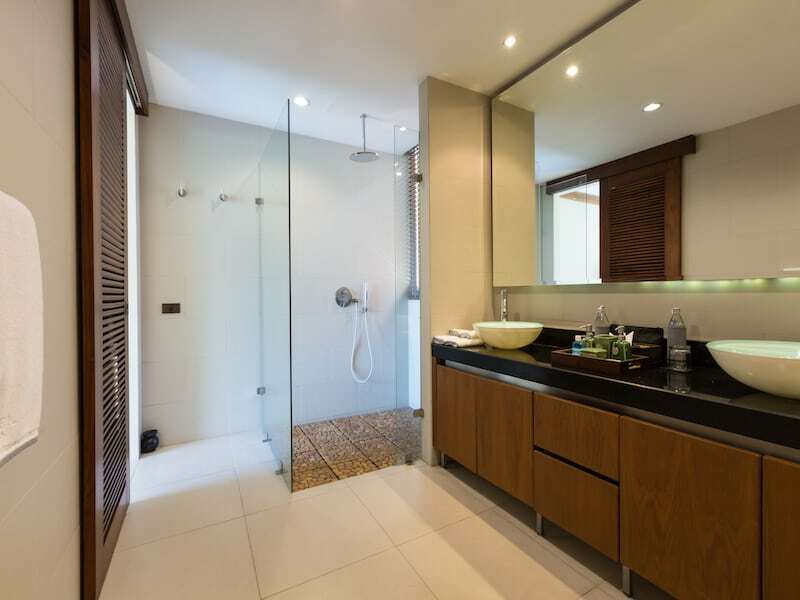 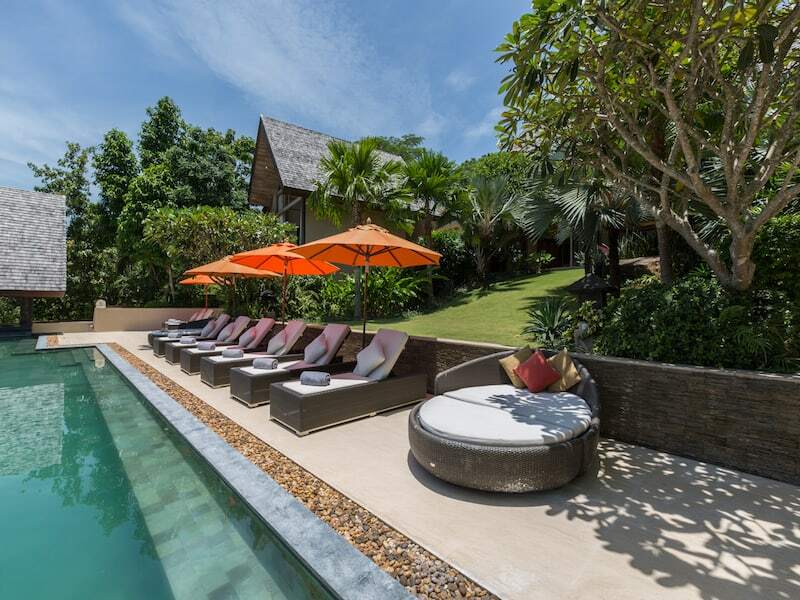 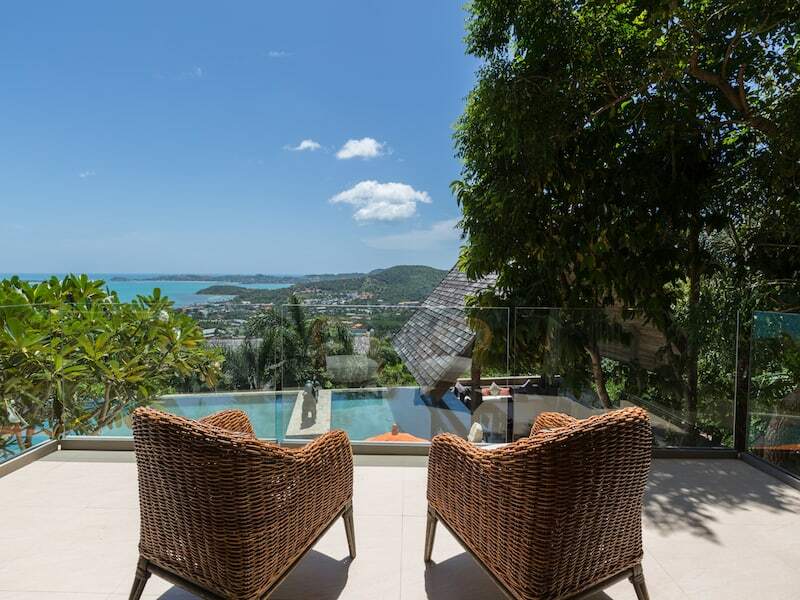 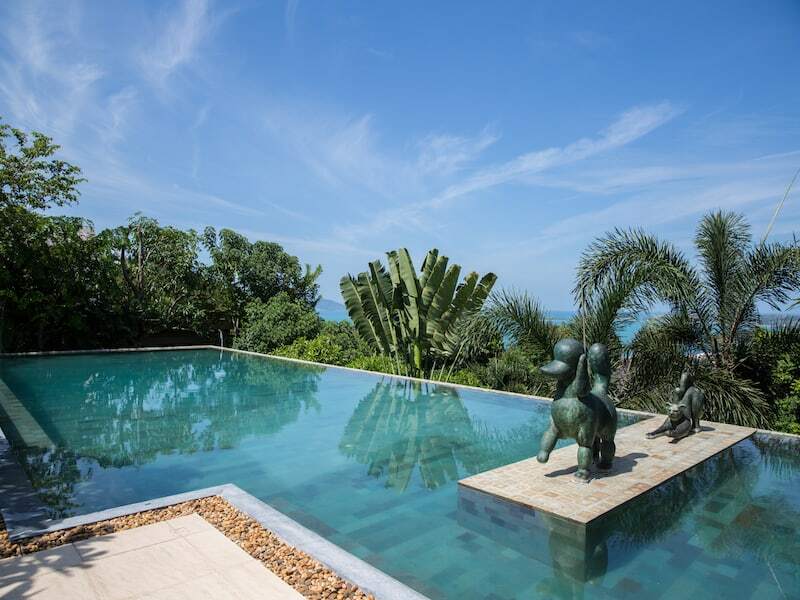 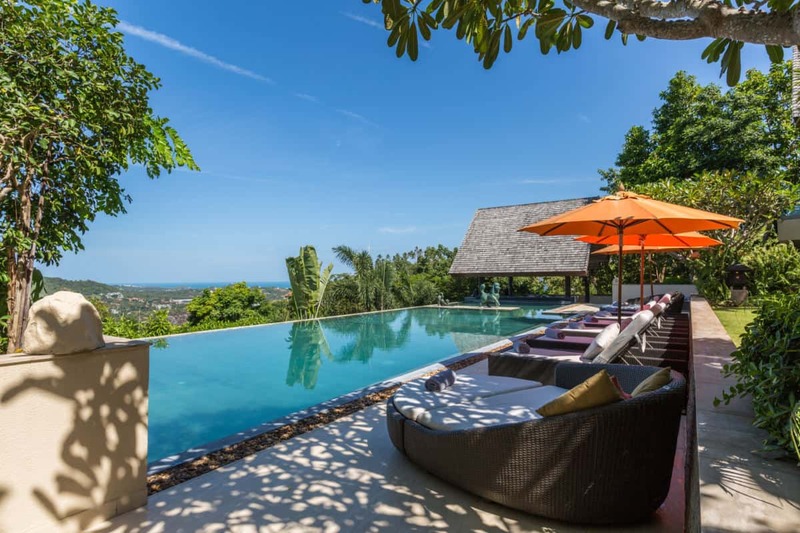 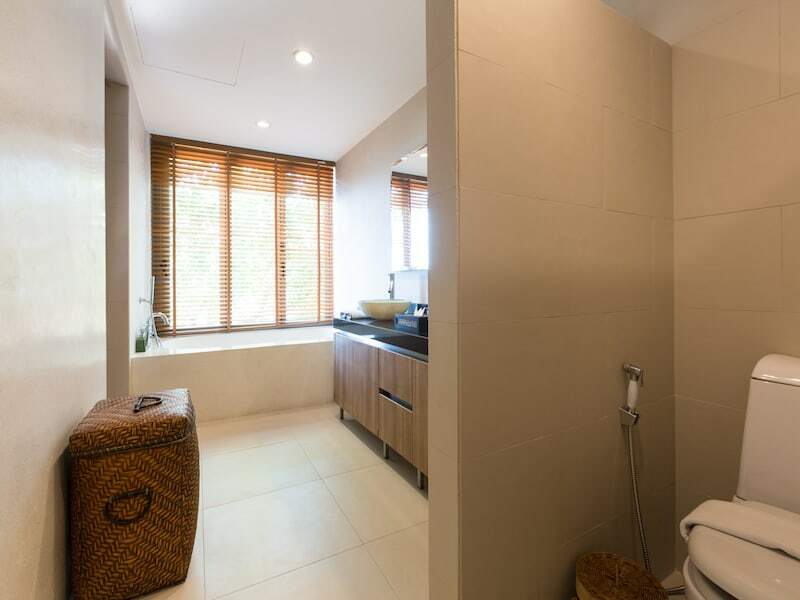 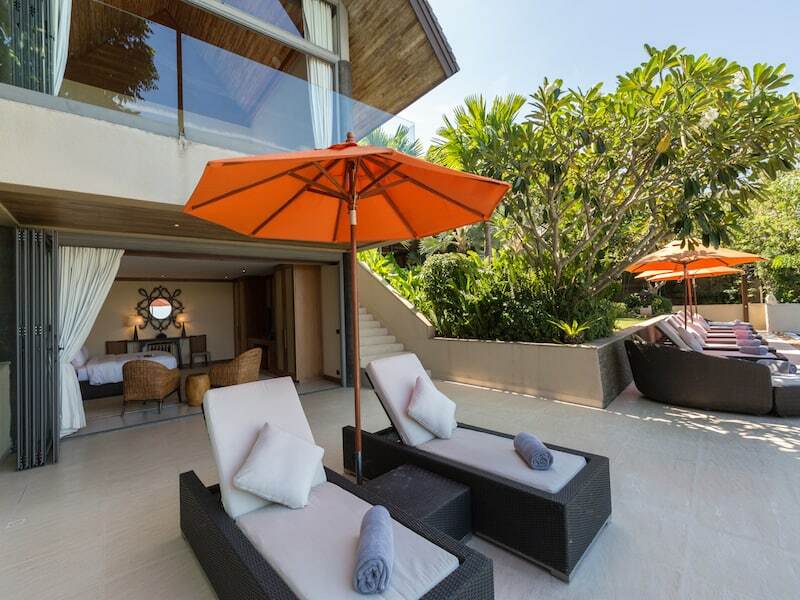 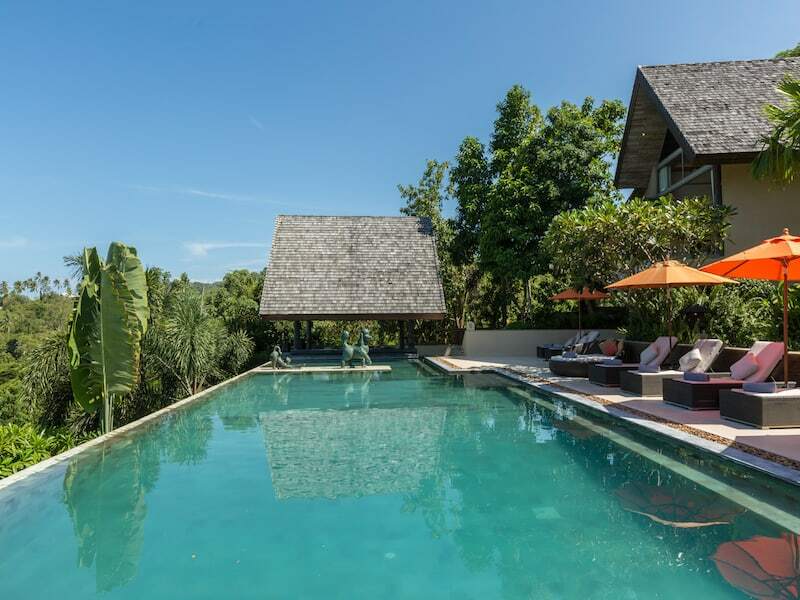 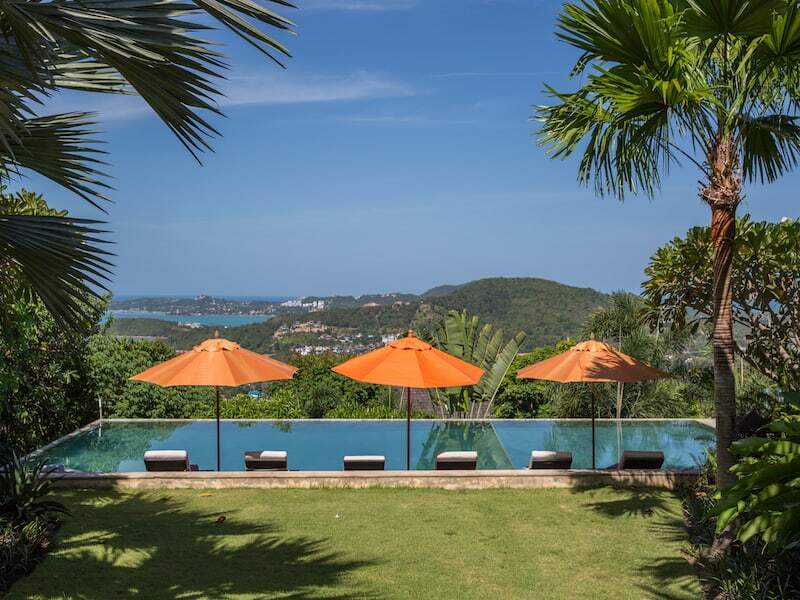 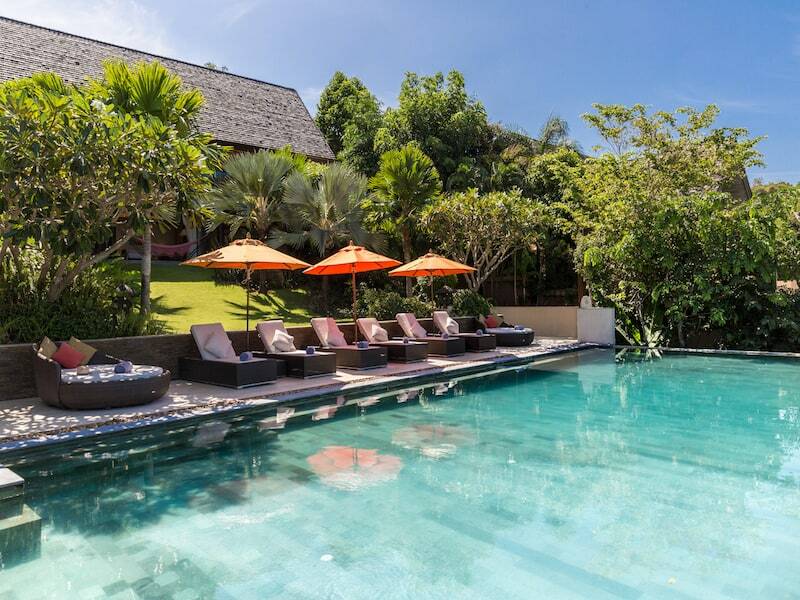 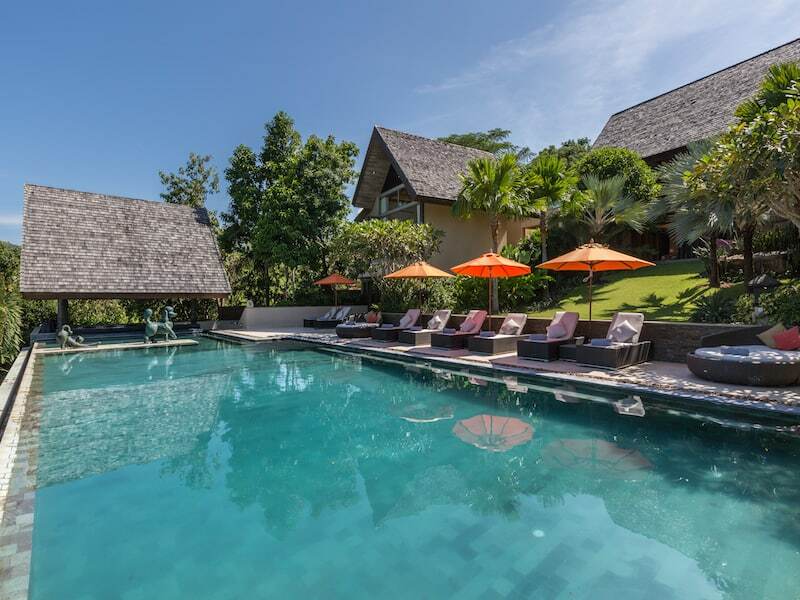 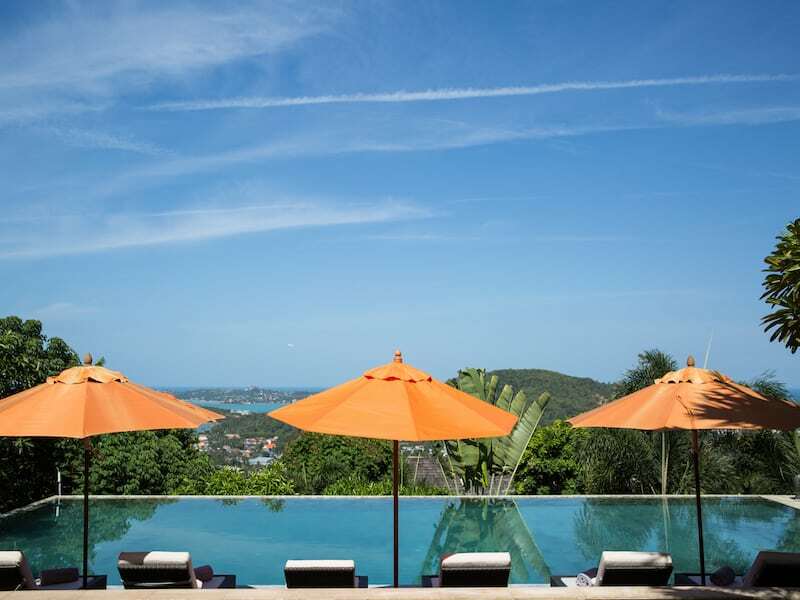 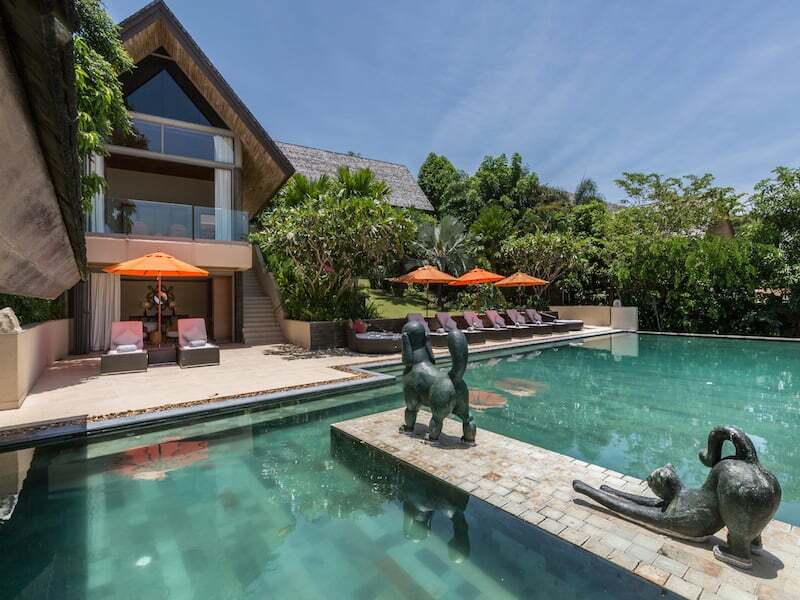 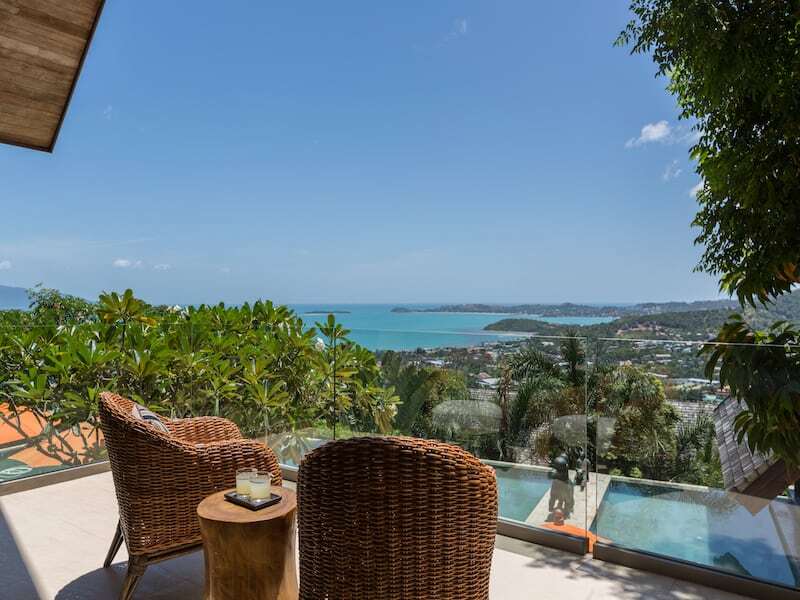 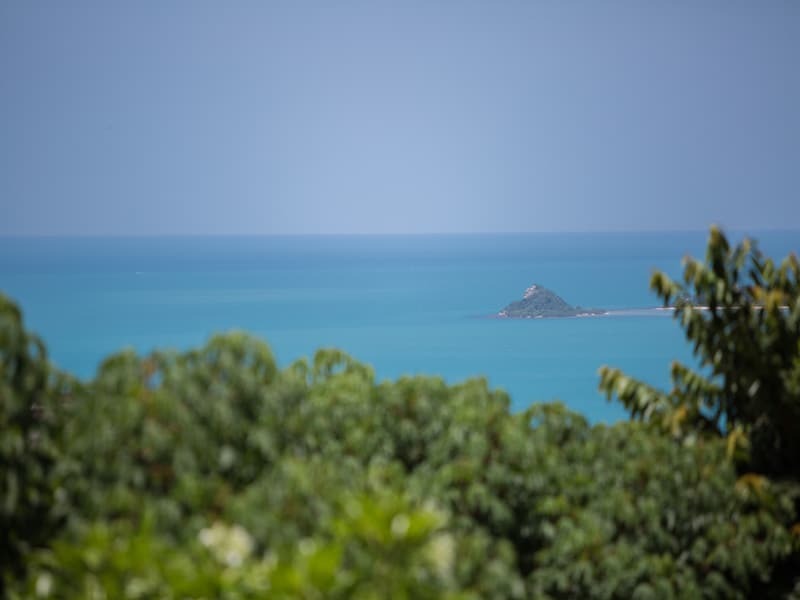 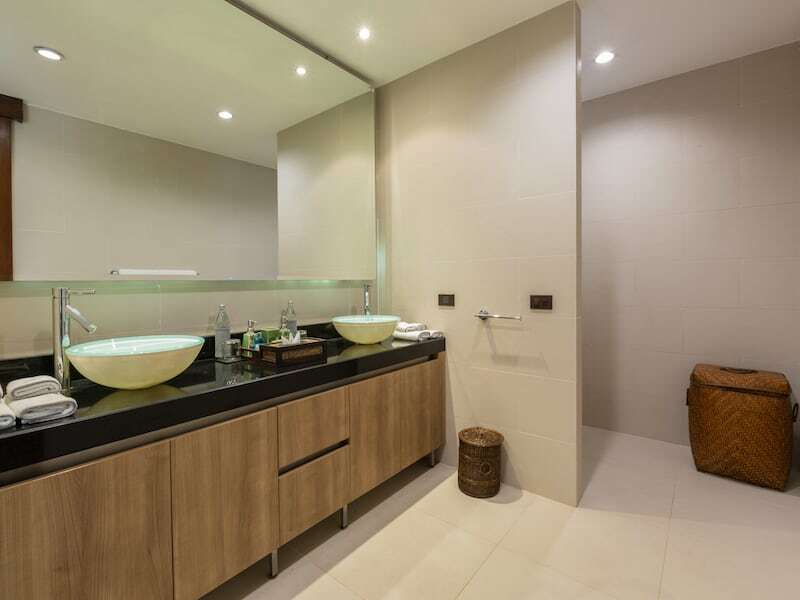 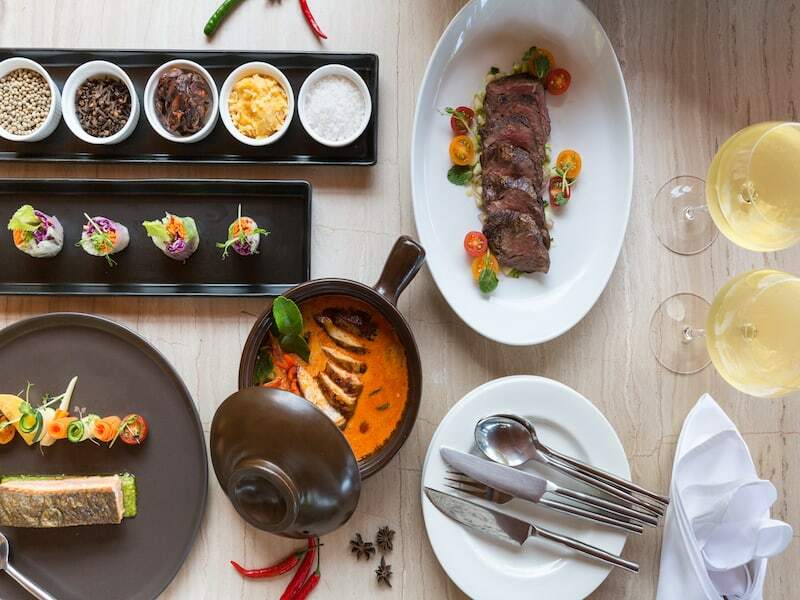 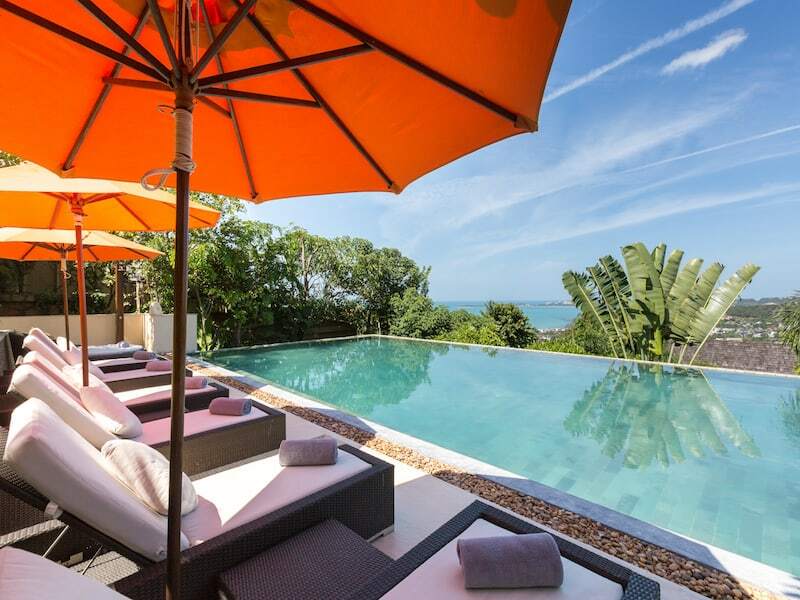 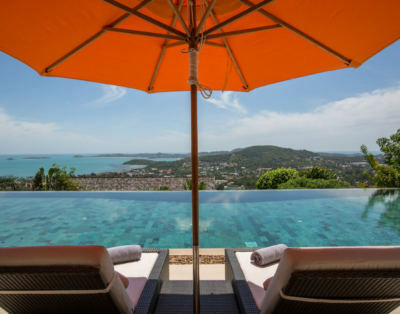 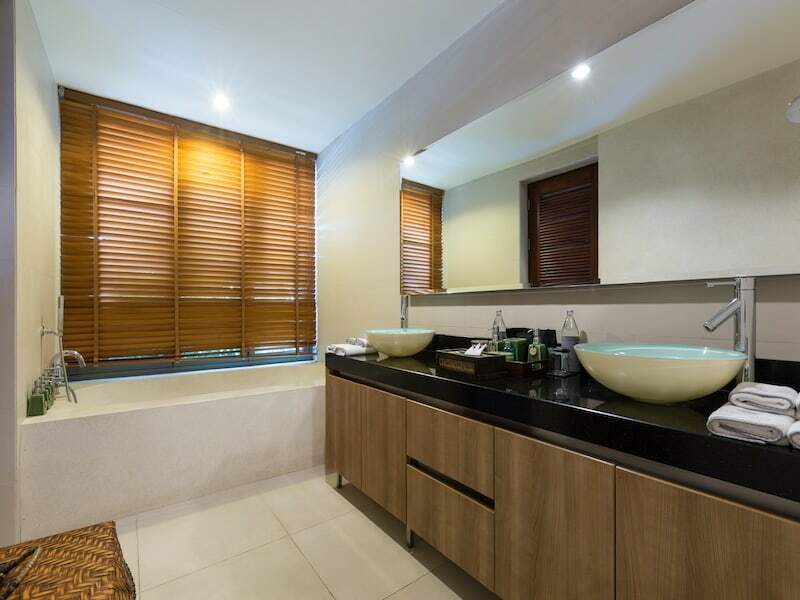 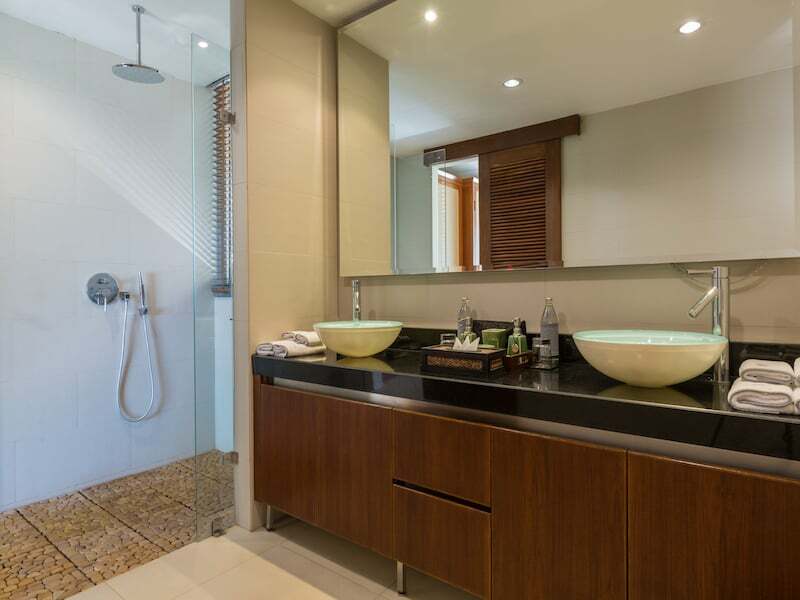 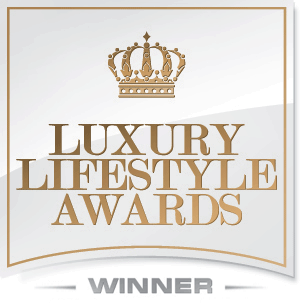 Atulya Residence is a beautiful villa located in the luxury Panacea Retreat on Koh Samui, an exclusive compound. 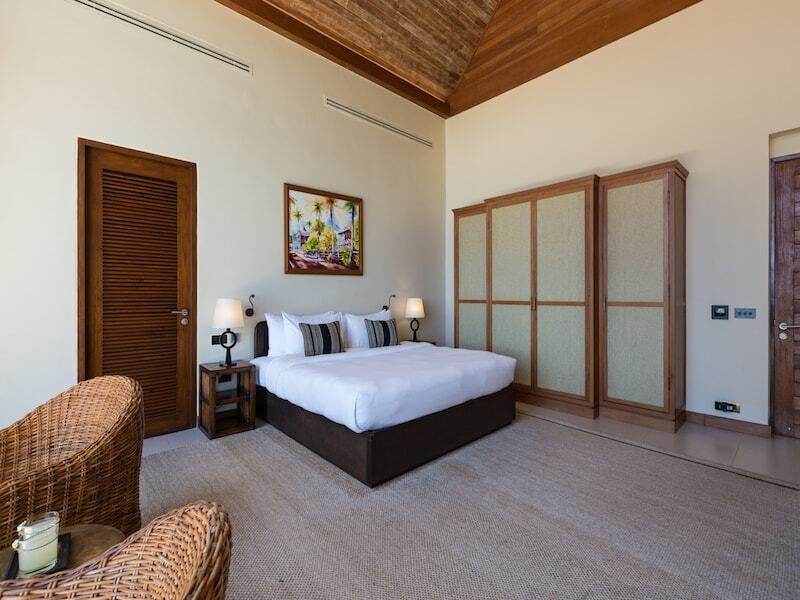 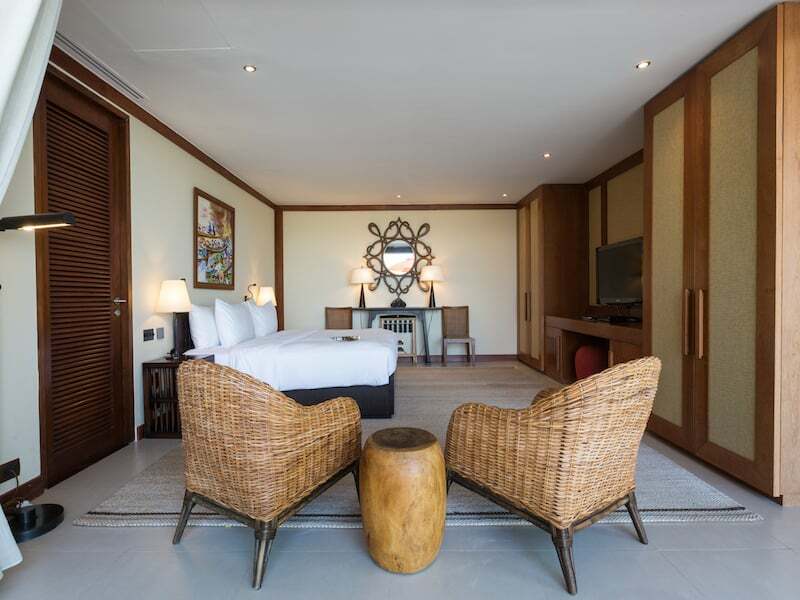 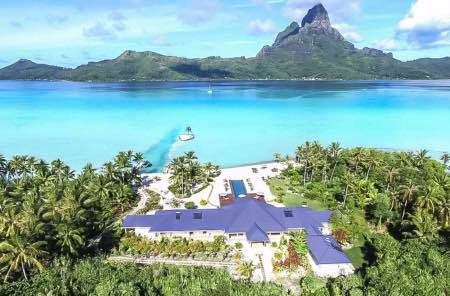 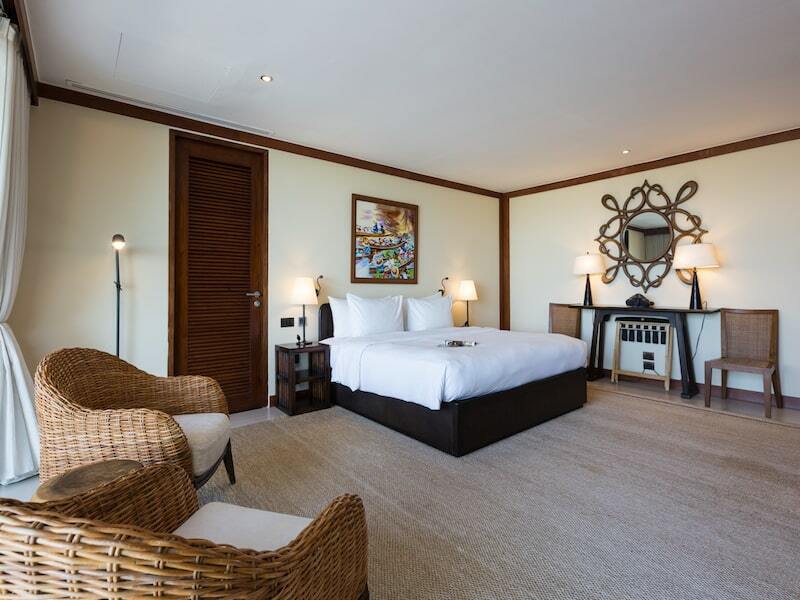 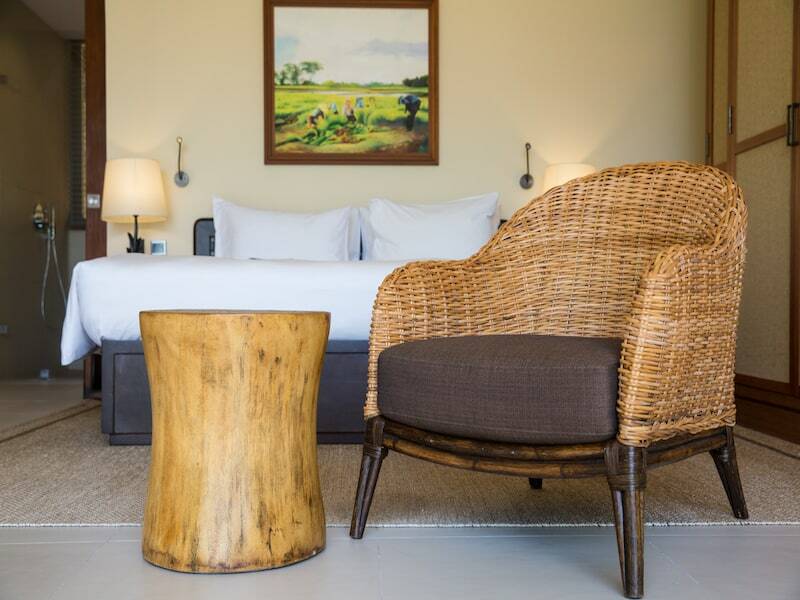 Atulya combines striking architectural features, exceptional furnishings and natural materials to create an enchanting luxury escape with stunning sea views from every room. 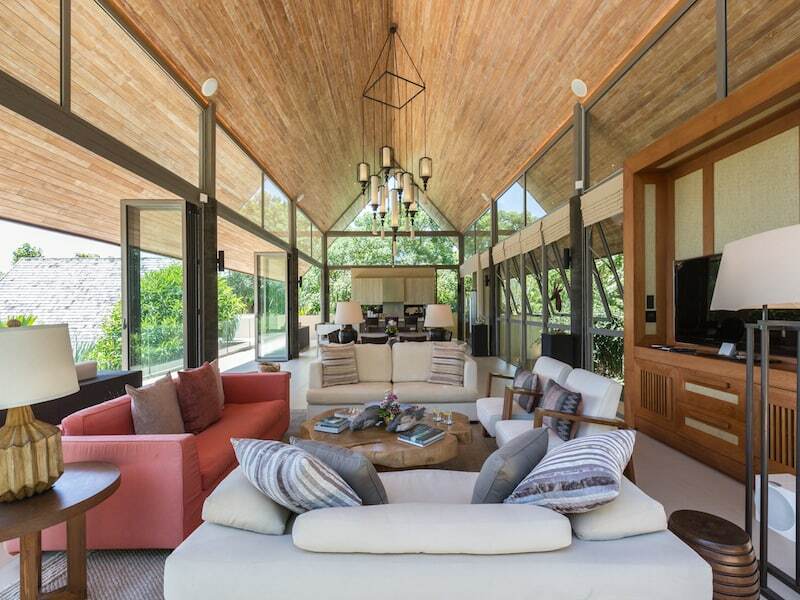 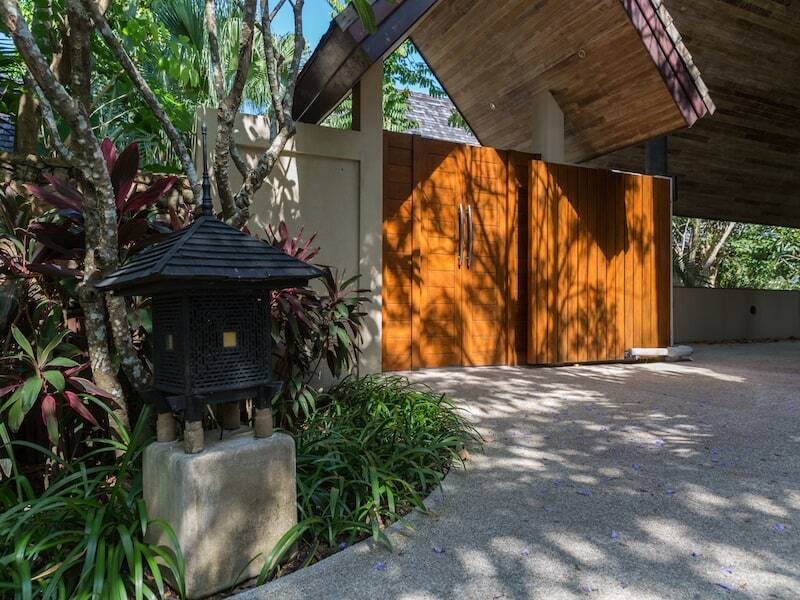 Entering the house through the stylish wooden gate, a large covered driveway connects via steps to the grand living pavilion, with its shingle roof adding a sense of tropical elegance. 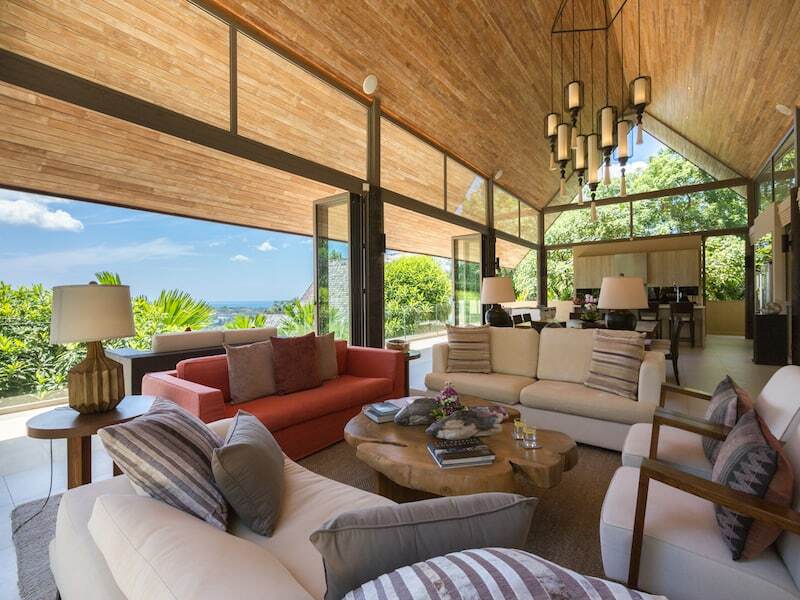 Large wooden doors open into the impressive elevated living area, an expansive room that runs virtually the entire length of the property. 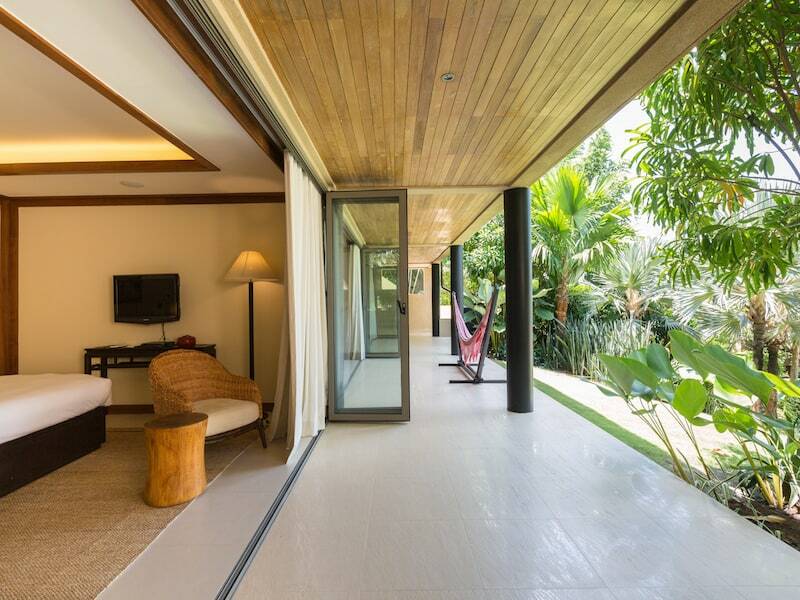 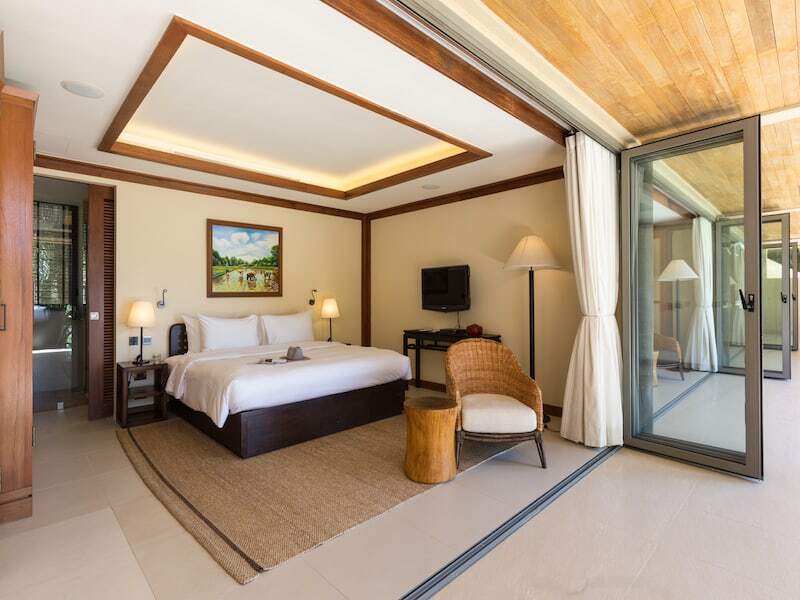 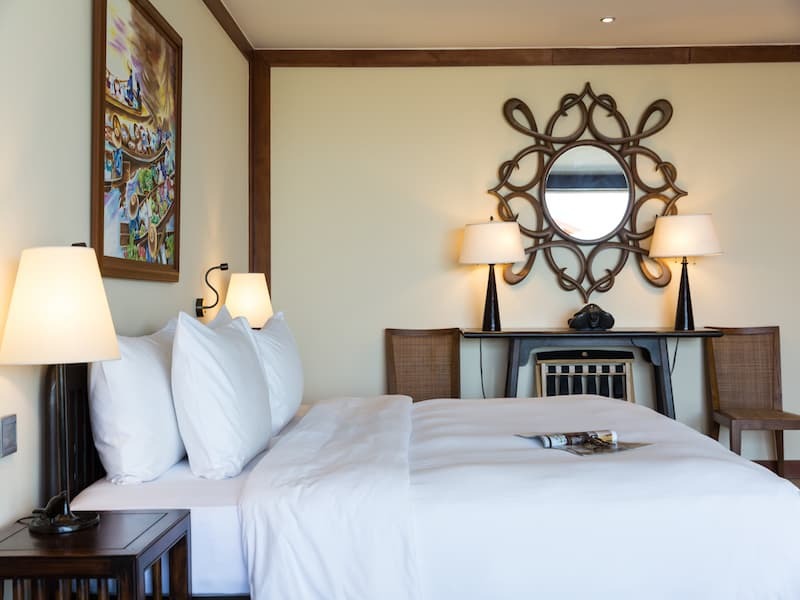 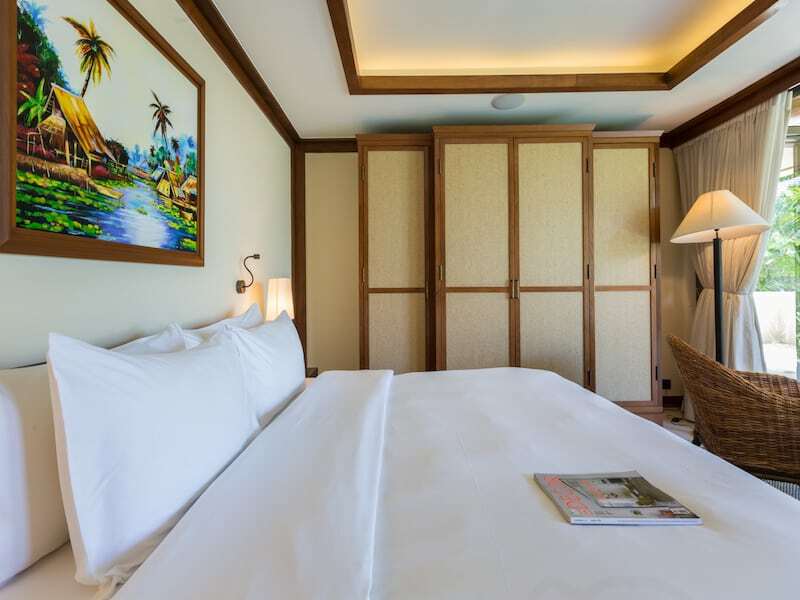 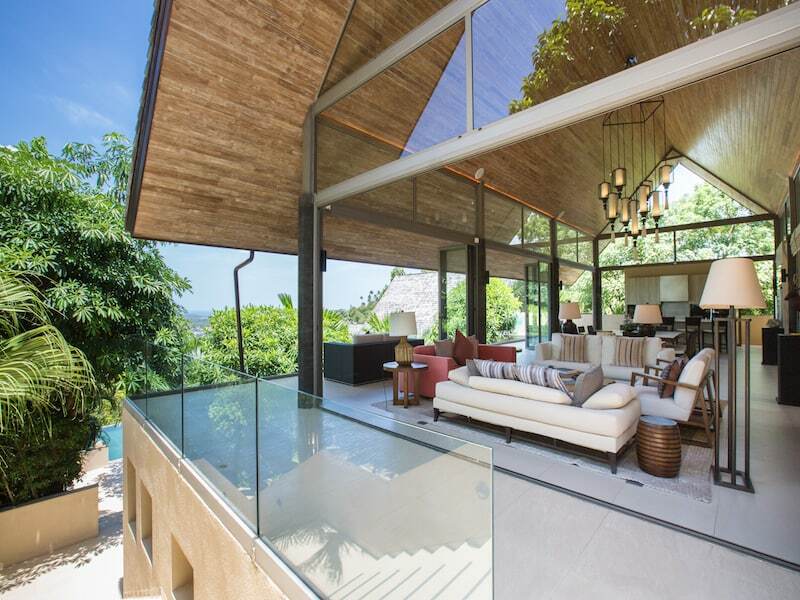 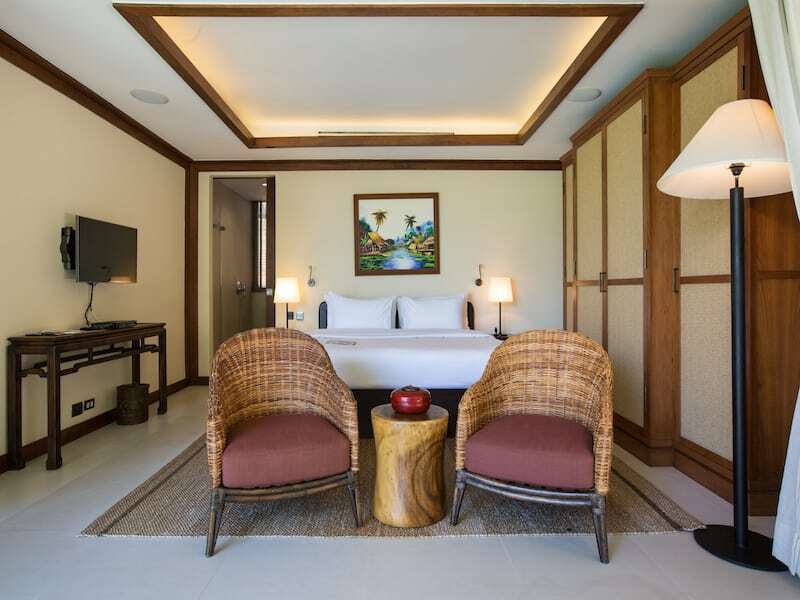 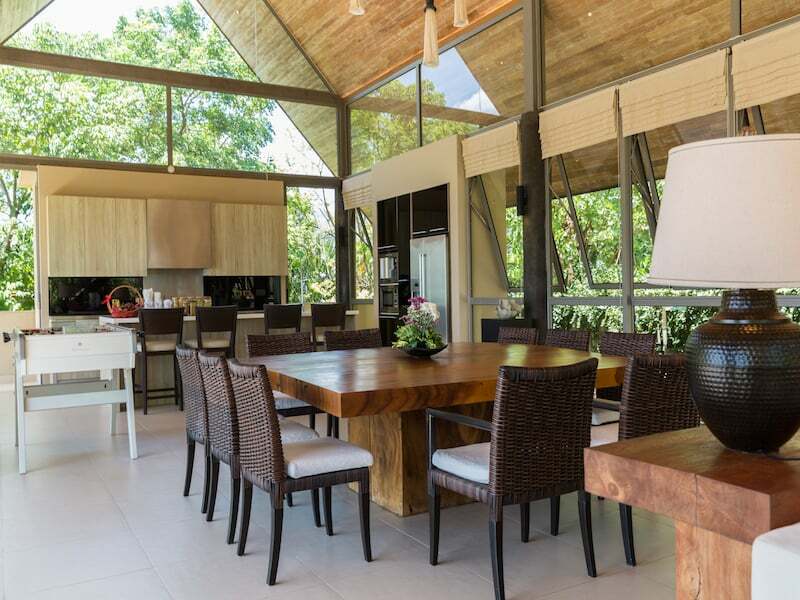 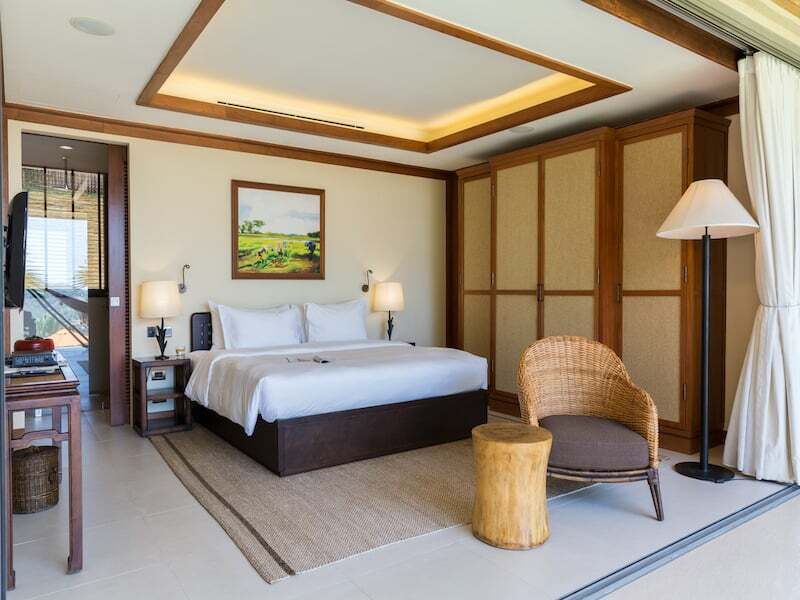 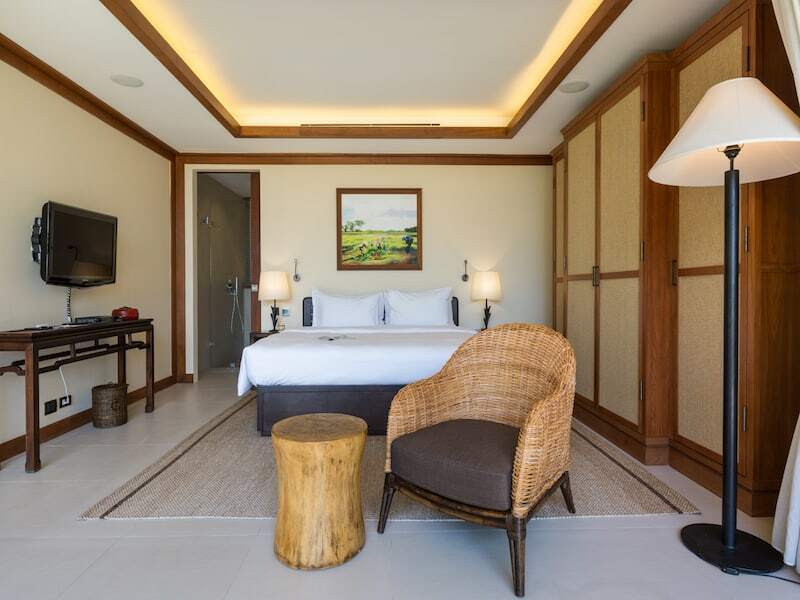 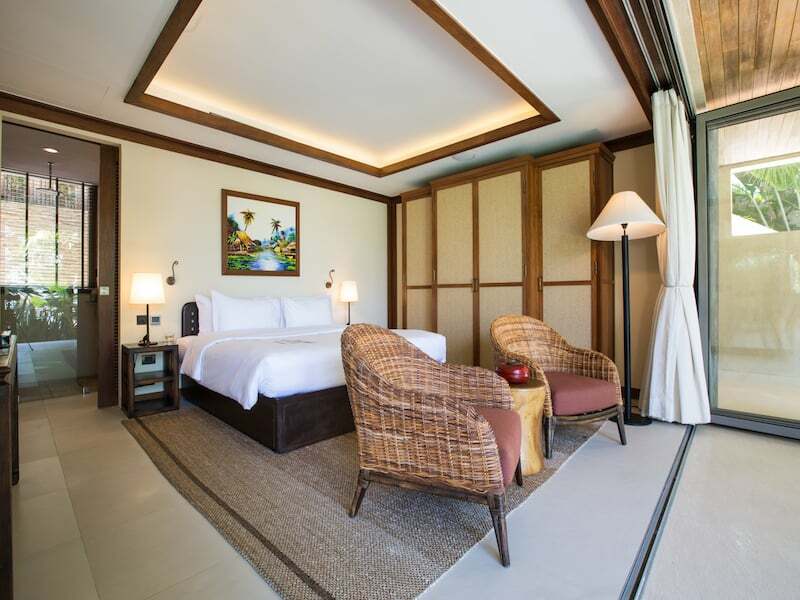 The high, wood-lined, and vaulted ceiling with windows on both sides guarantee a feeling of spacious opulence and bi-folding glass doors ensure constant panoramic views across the palm-clad valleys, and out to the bay of Bophut and offshore islands. 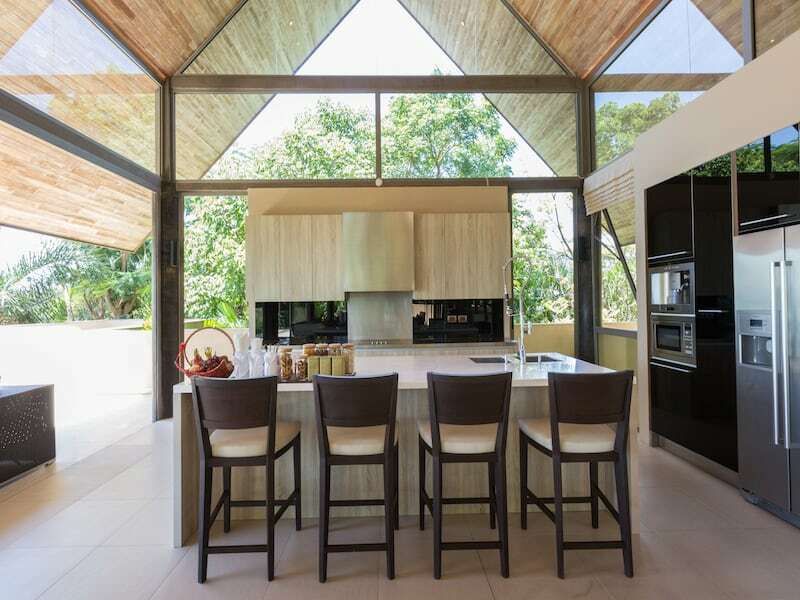 An eye-catching wooden dining table sits in the centre of the room, served by a sophisticated kitchen with an island breakfast bar and brand name, fitted appliances. 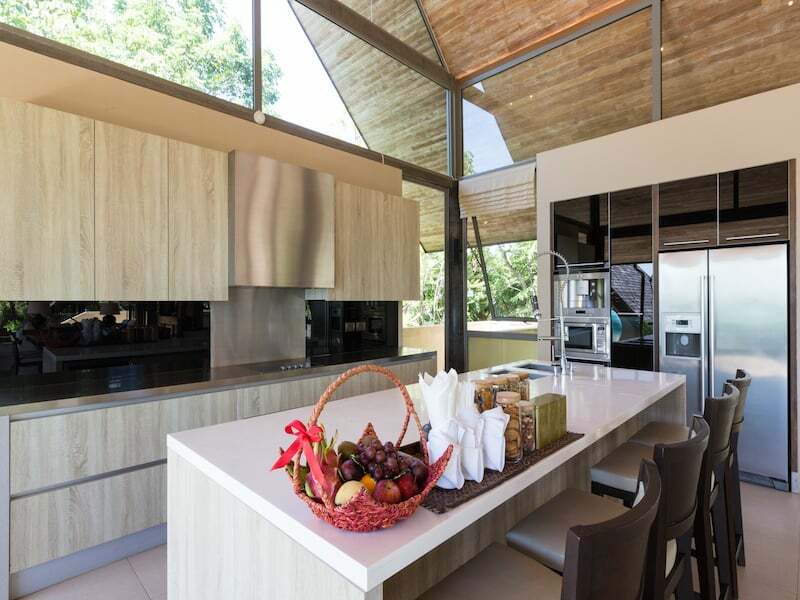 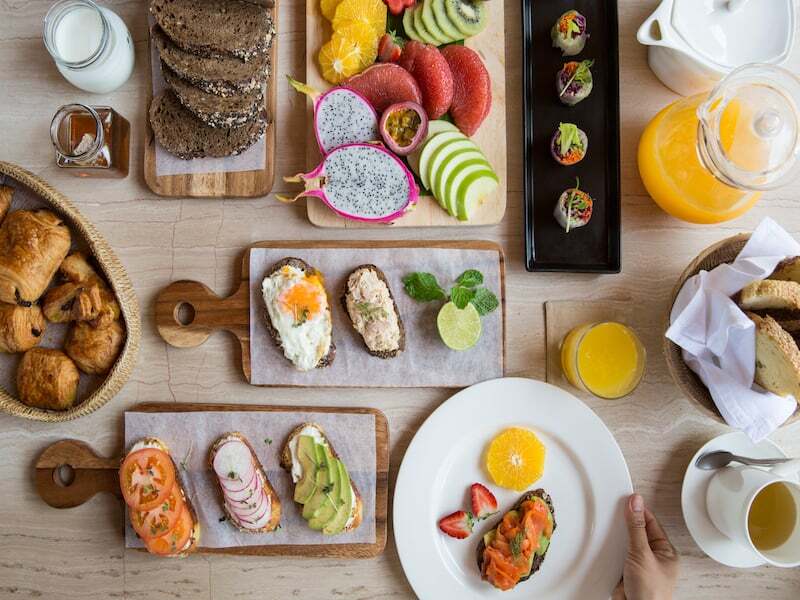 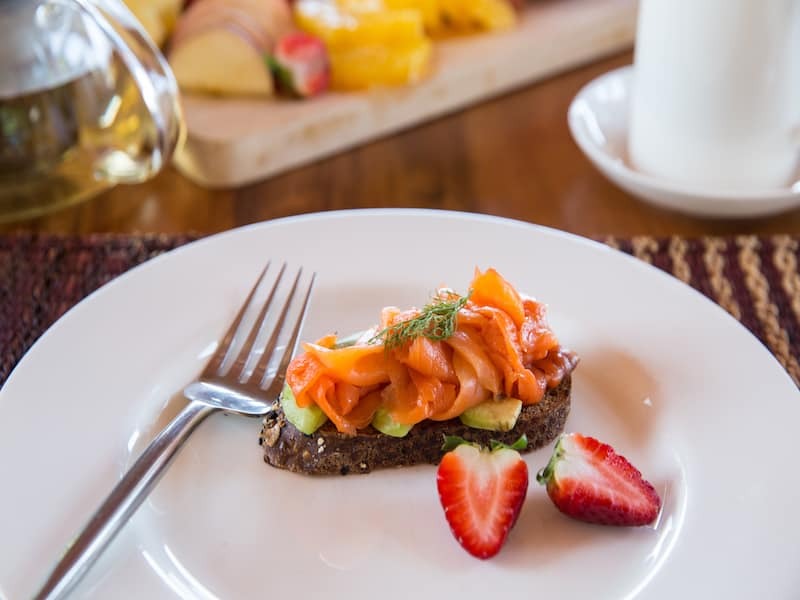 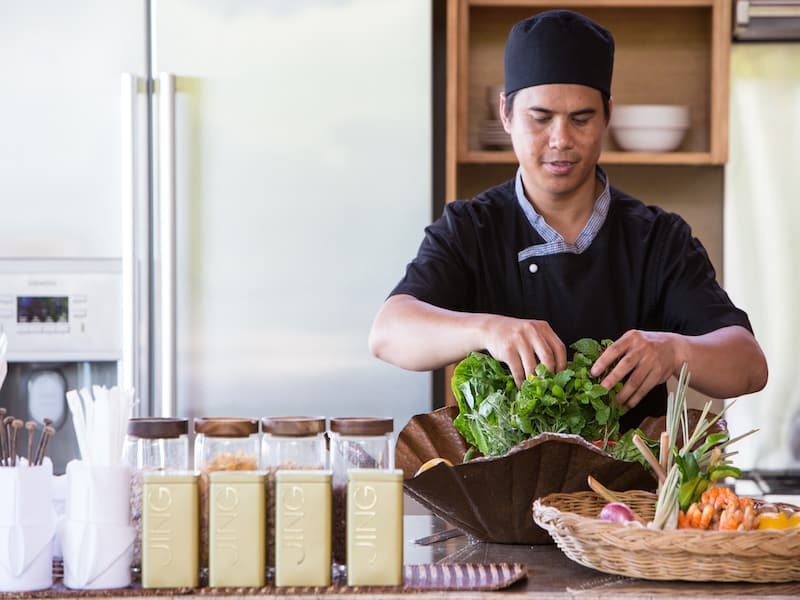 The kitchen not only looks great with its wooden units, chrome fittings and marble surfaces, but it is also well designed to include everything guests may need during their stay. 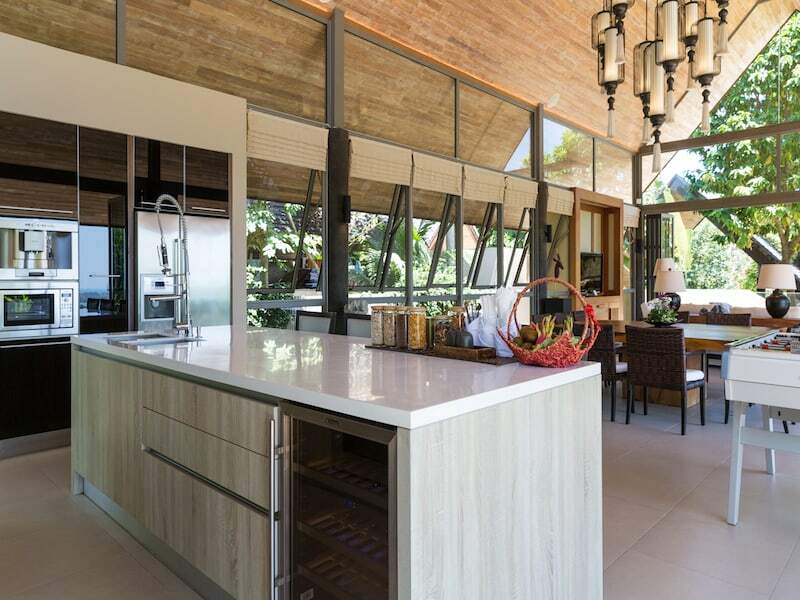 It even features a built-in wine cooler for chilled refreshments day and night. 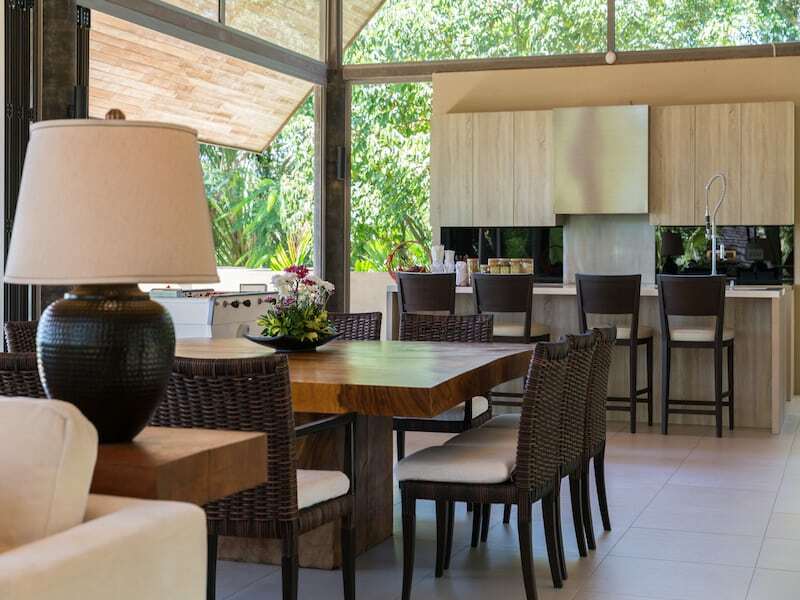 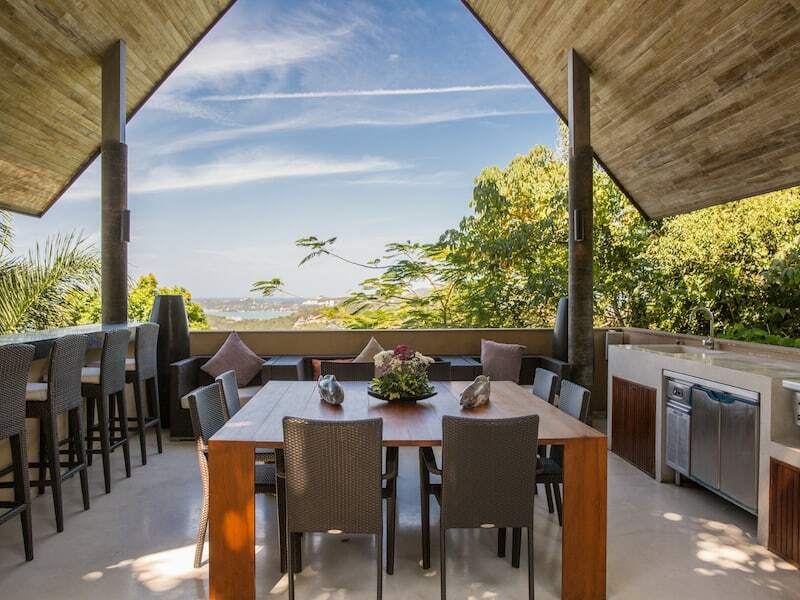 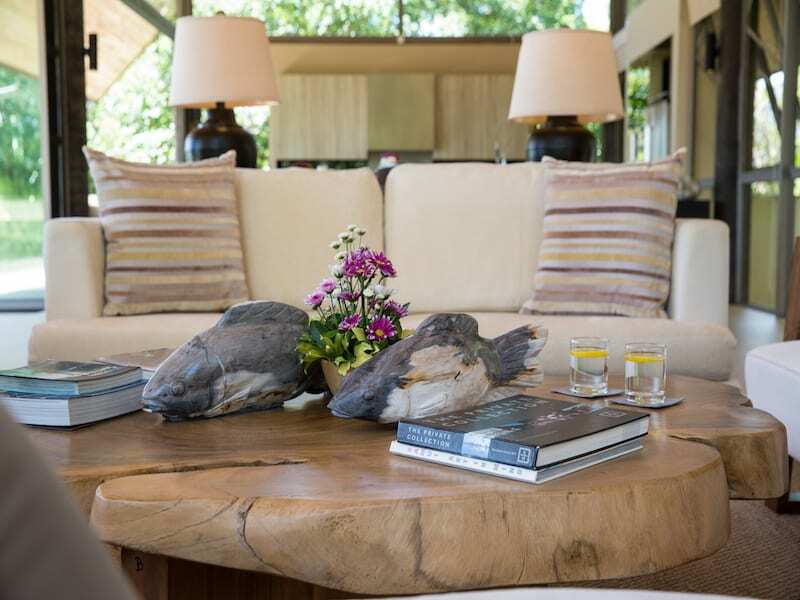 On the opposite side of the dining table, the villa’s spacious lounge area boasts a huge, flat screen TV mounted on a cabinet with plush sofas and chairs poised for visual repose. 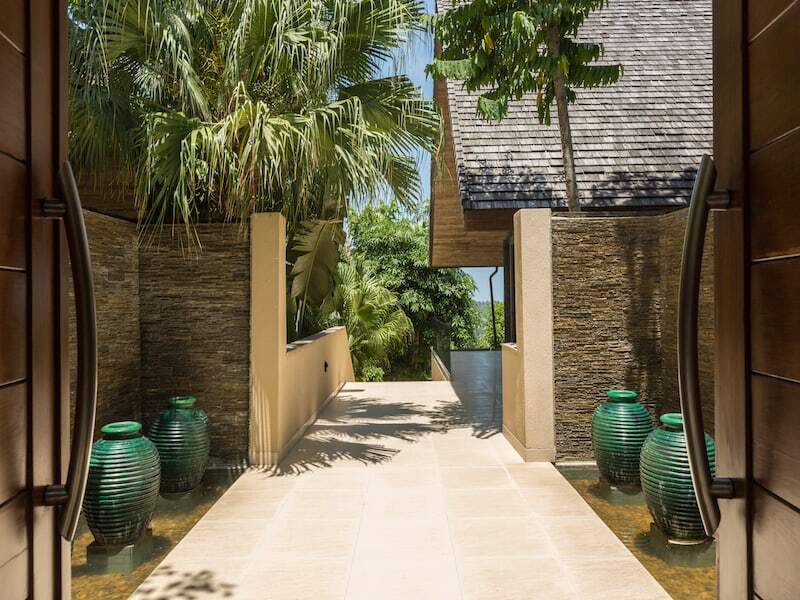 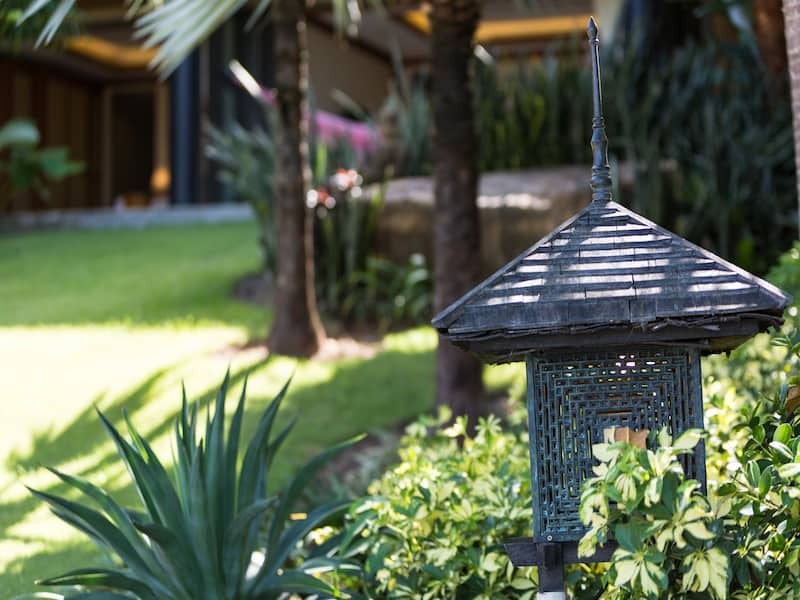 Contemporary ornaments and artworks add a sophisticated ambience to the interior, while outside, a covered balcony runs along the entire length of the pavilion, guarded by an invisible glass barrier and overlooking the villa’s tropical garden and generous infinity pool. 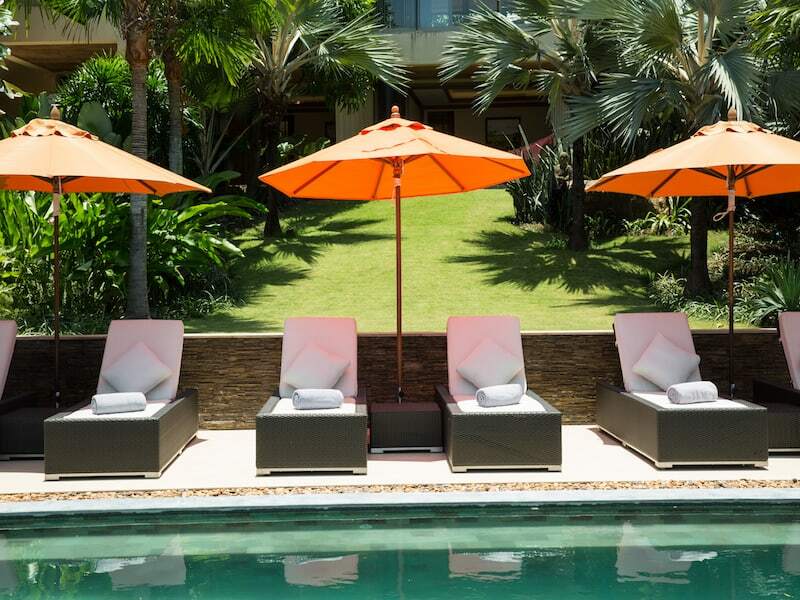 All-weather chairs add a final touch, offering the perfect place to relax with a book, take in the ocean views or sip a cocktail at sunset. 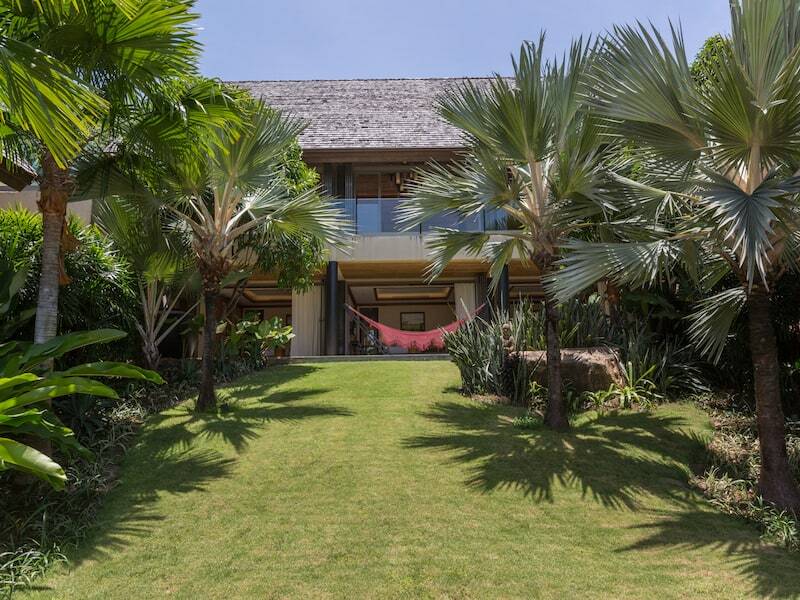 Stairs on both sides of the balcony lead down to the villa’s lower level where three attractive and comfortable bedrooms look out across the garden, pool and views. 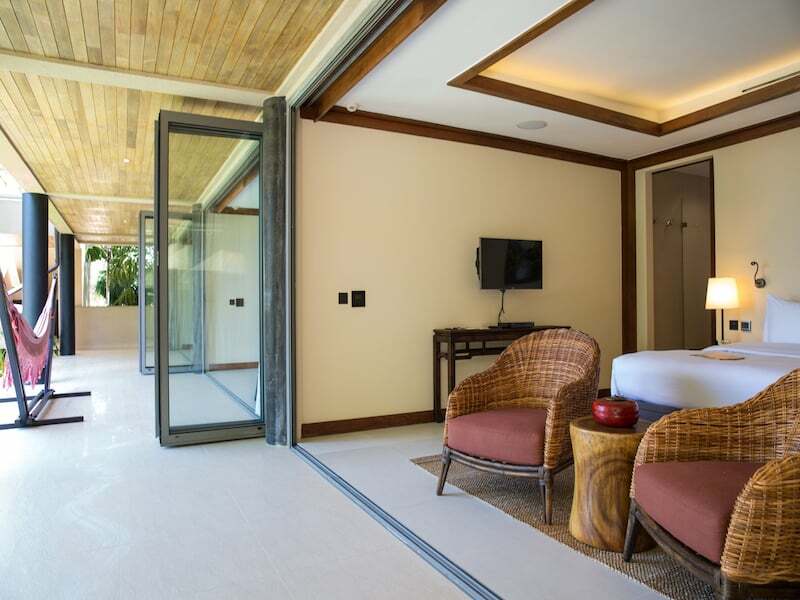 A covered walkway runs along the front of these rooms giving each one its own outdoor terrace and all three bedrooms feature built-in wardrobes and appealing en-suite rain shower rooms. 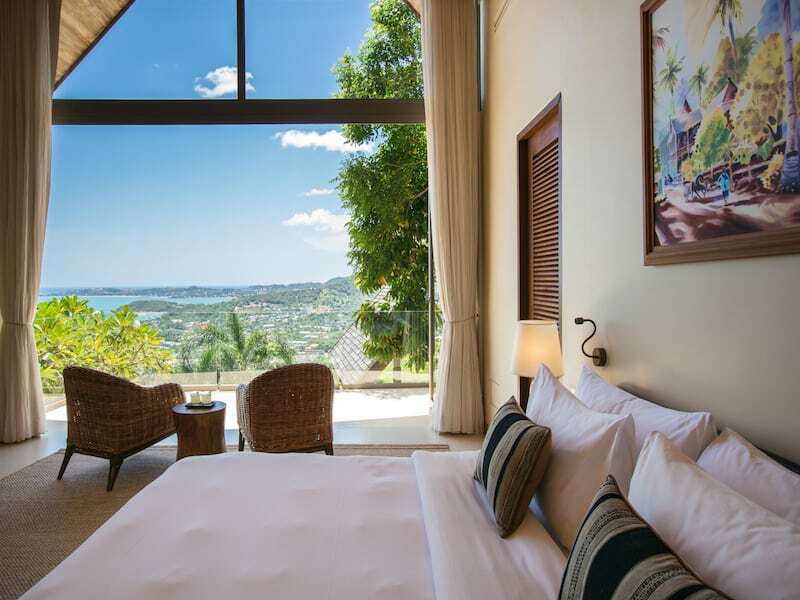 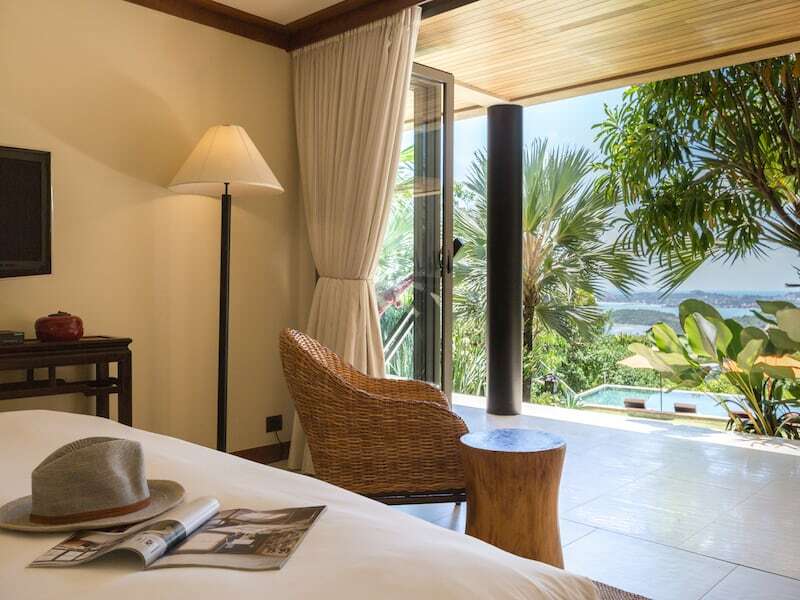 All three rooms have double king size beds, making this an ideal villa for families or groups. 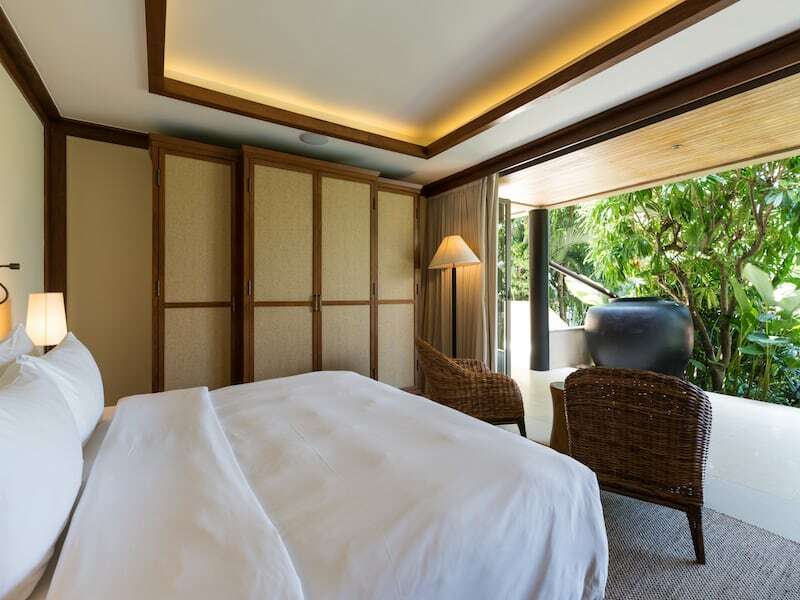 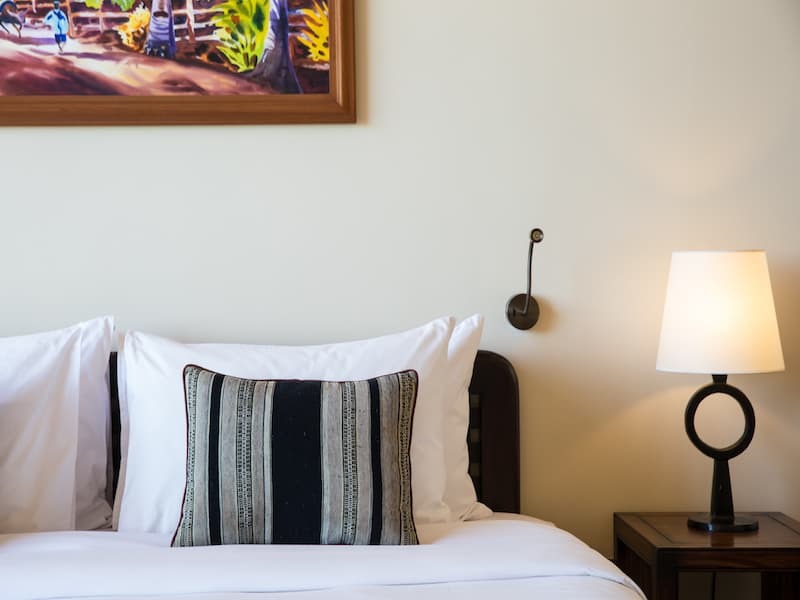 In each bedroom, the furniture is of the highest quality, with stylish modern accessories and AV equipment making them far more than just a place to sleep. 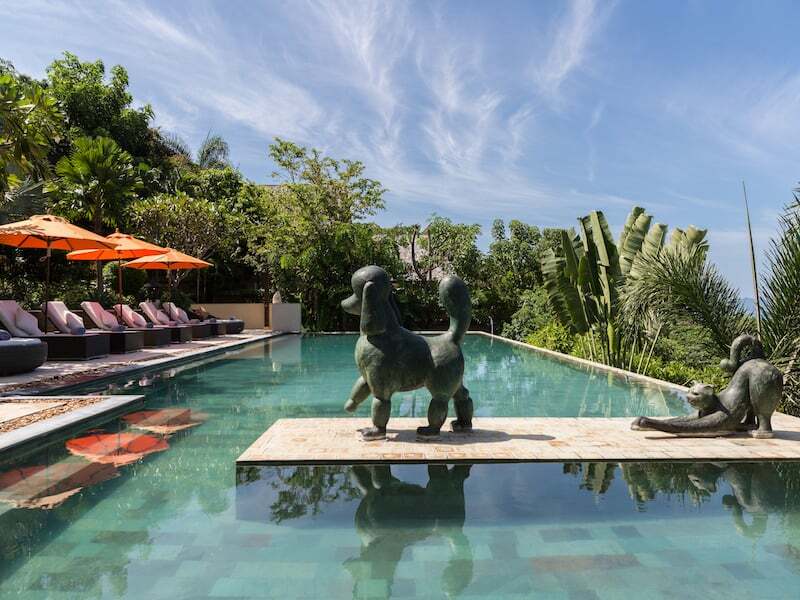 In front of the bedrooms, a lawn and garden extends to the wide pool terrace. 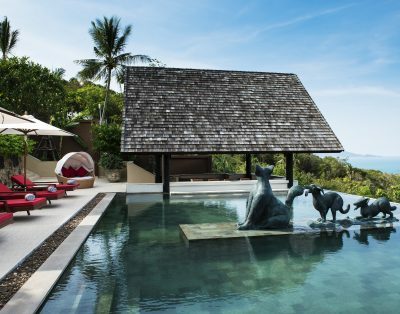 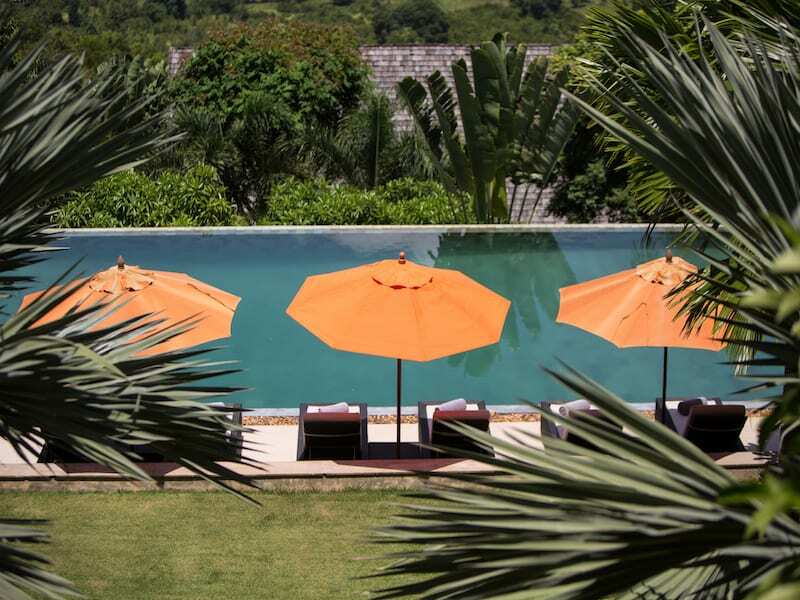 To one side of the pool, sunken stools are served by a swim up bar that is incorporated into a covered sala or gazebo, which also houses a dining table and cushioned bench seats, the ideal place to gather and relax day or night. 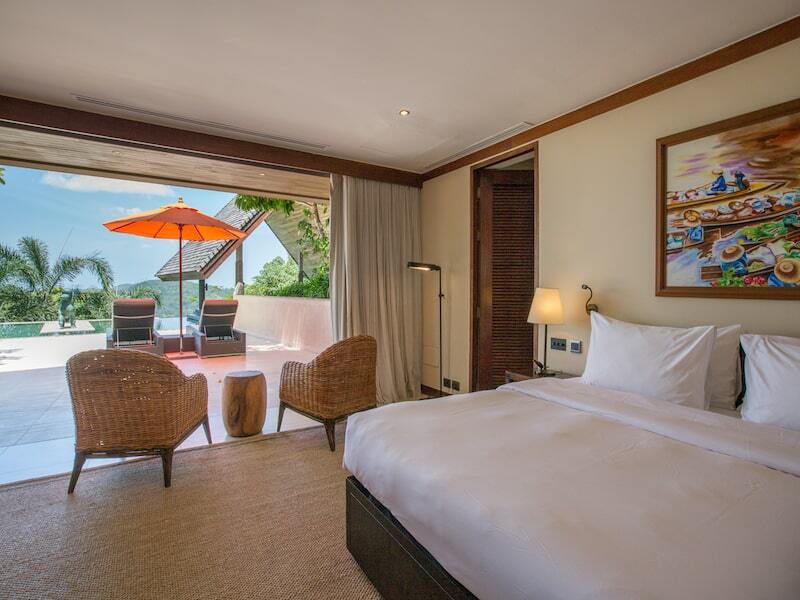 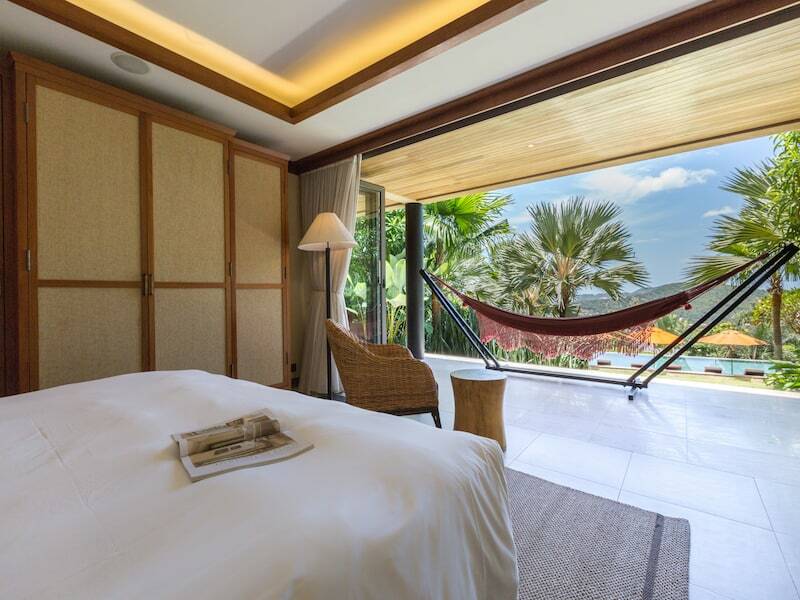 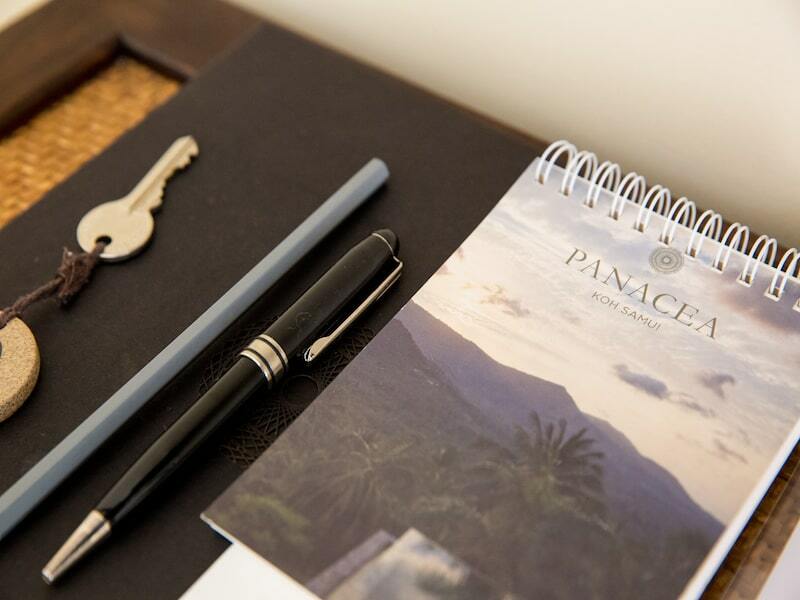 On the other side of the pool, one of the villa’s two master suites offer an experience to remember. 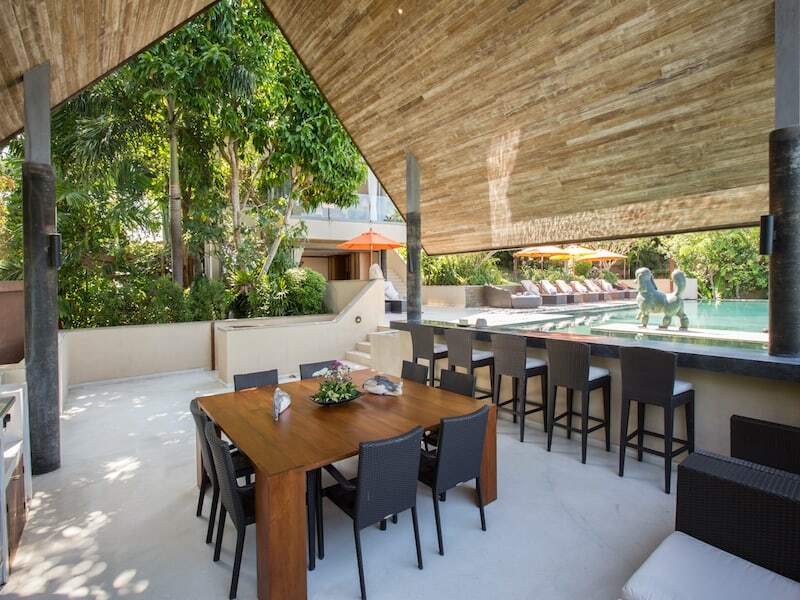 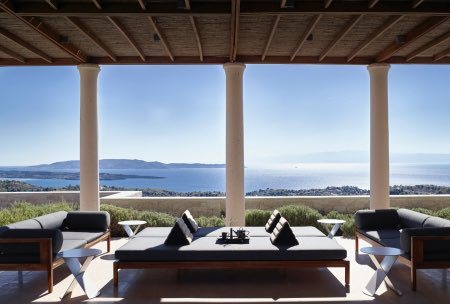 A vaulted wooden ceiling with glass at the front and back creates an airy, light atmosphere with doors opening directly onto the pool terrace and drawing in the spectacular views. 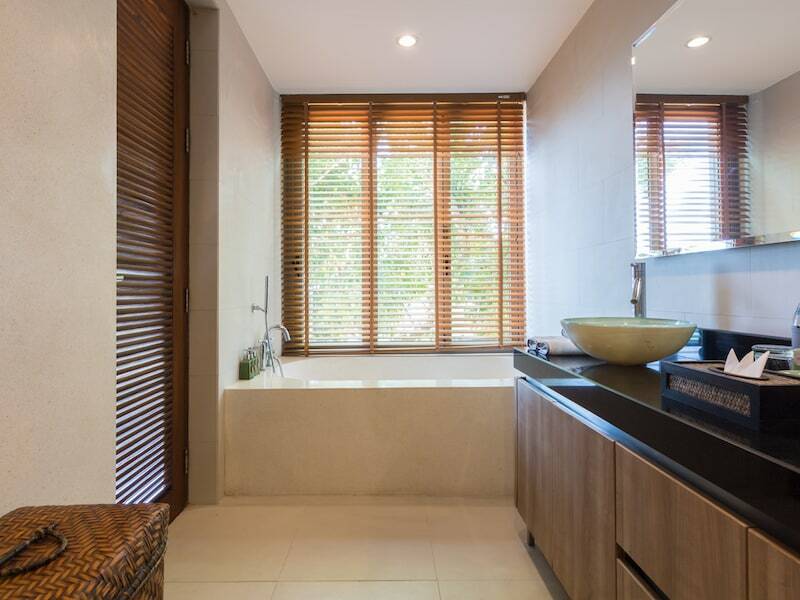 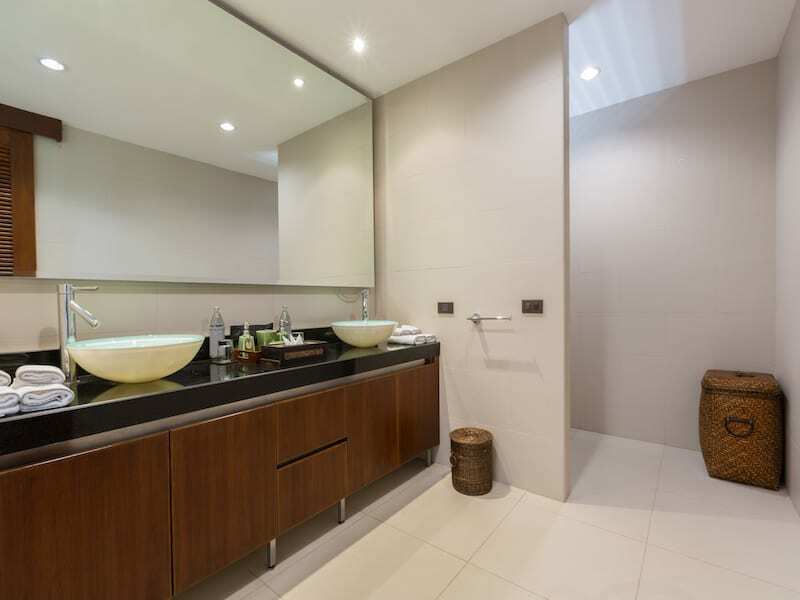 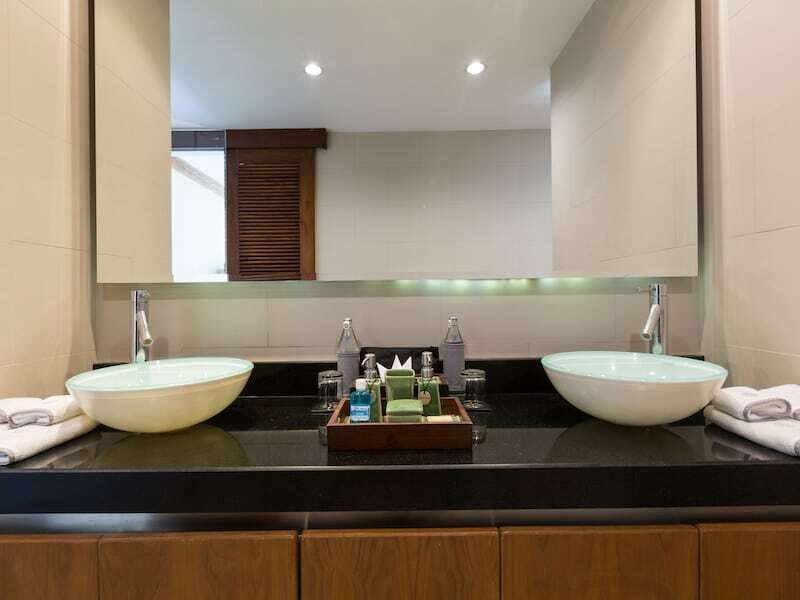 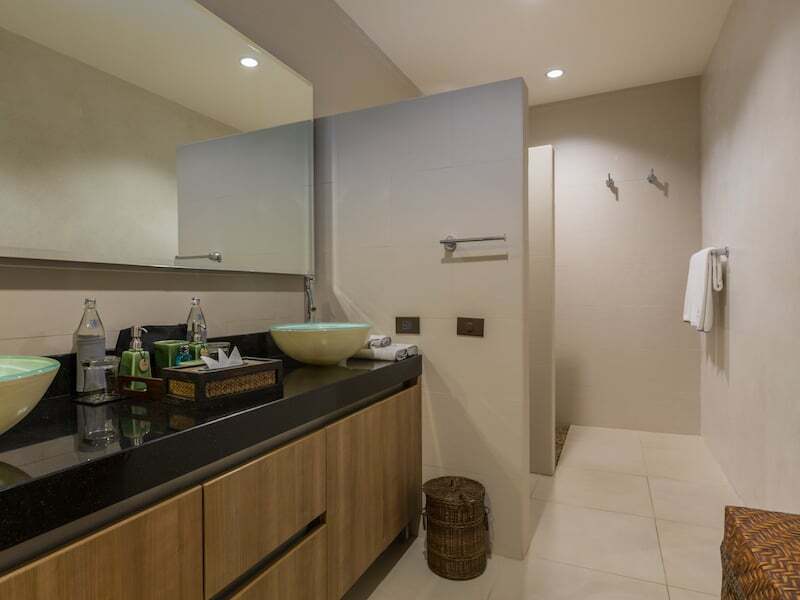 A separate dressing area behind the kind sized bed leads into an en-suite bathroom with twin sinks, a rain shower and an indulgent terrazzo bathtub with windows looking directly out to the ocean beyond. 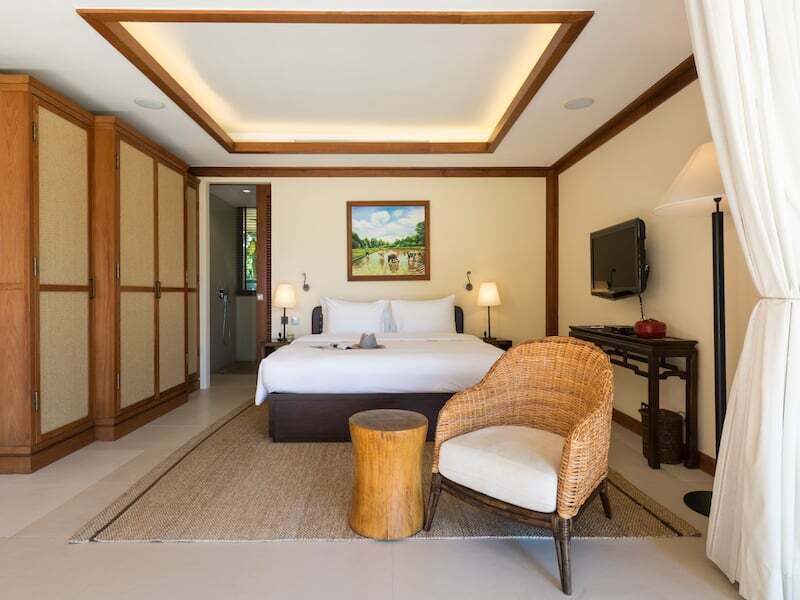 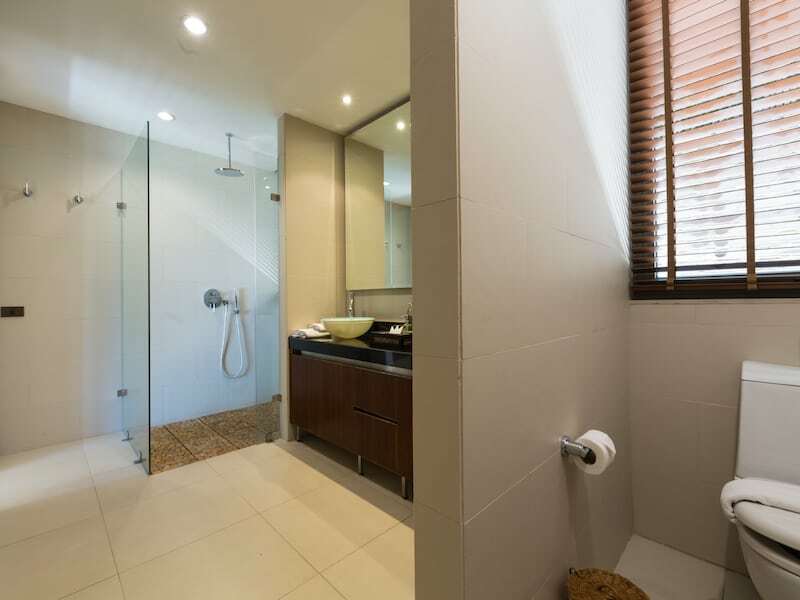 Bedrooms/Baths Description: All three rooms have double king size beds, making this an ideal villa for families or groups. 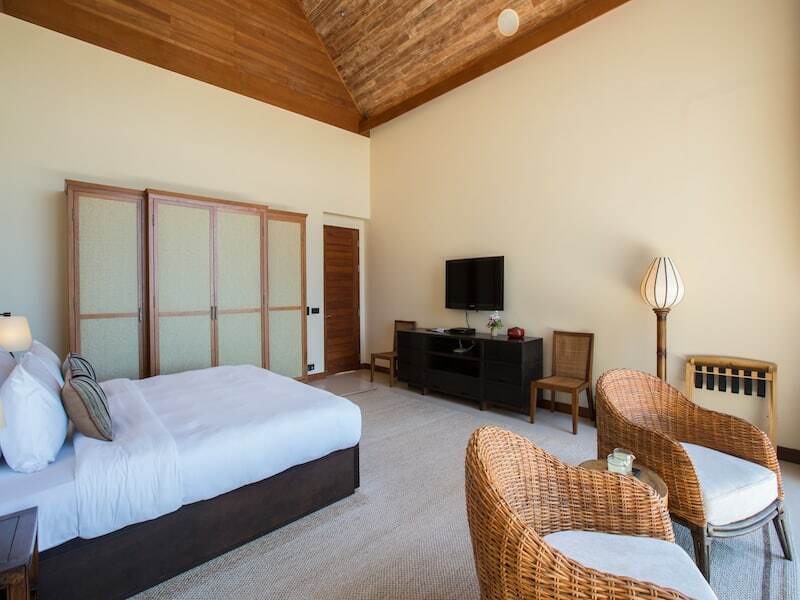 In each bedroom, the furniture is of the highest quality, with stylish modern accessories and AV equipment making them far more than just a place to sleep. 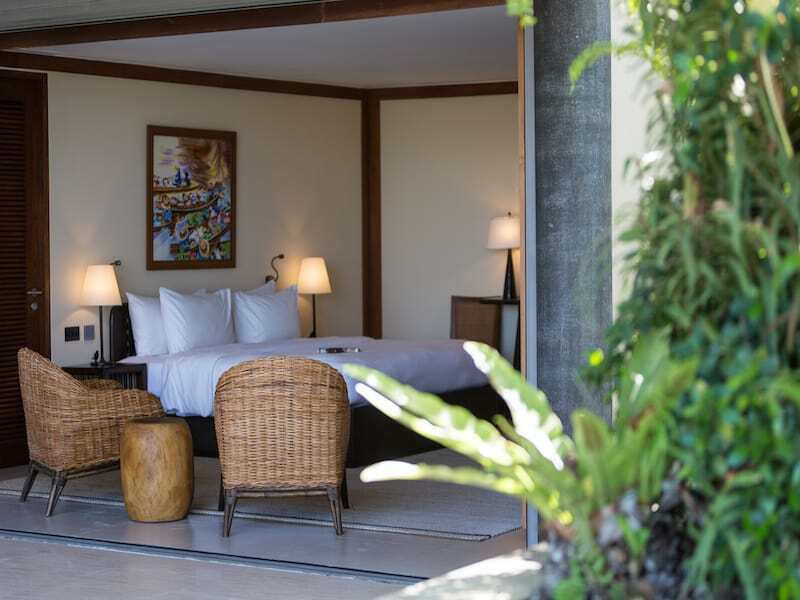 On the other side of the pool, one of the villa's two master suites offer an experience to remember. 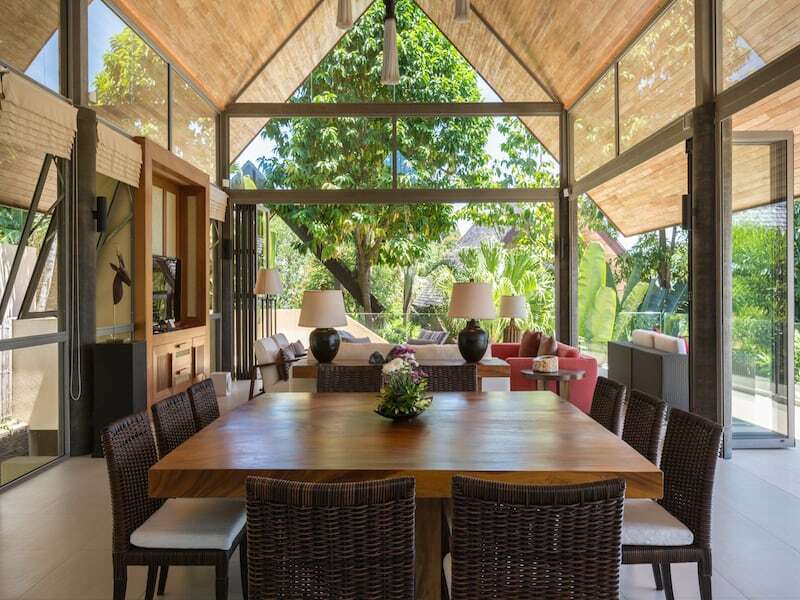 A vaulted wooden ceiling with glass at the front and back creates an airy, light atmosphere with doors opening directly onto the pool terrace and drawing in the spectacular views. 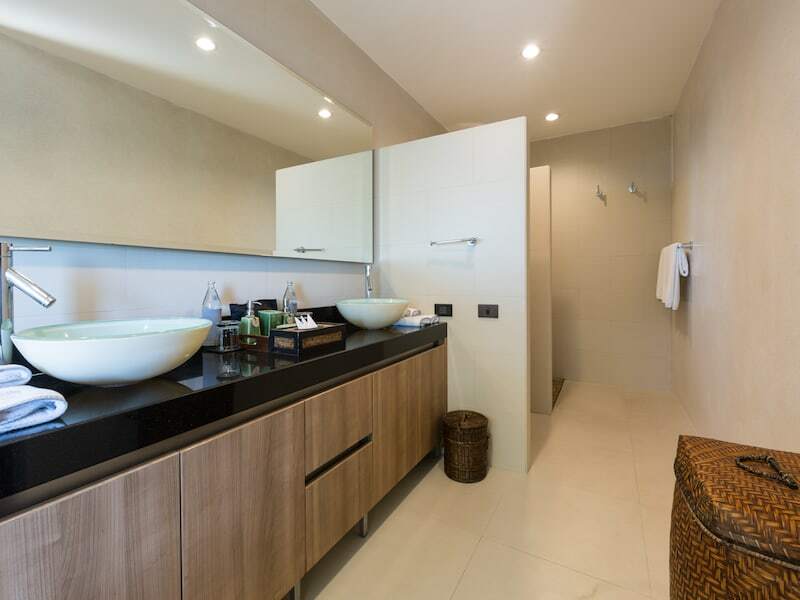 A separate dressing area behind the kind sized bed leads into an en-suite bathroom with twin sinks, a rain shower and an indulgent terrazzo bathtub with windows looking directly out to the ocean beyond.